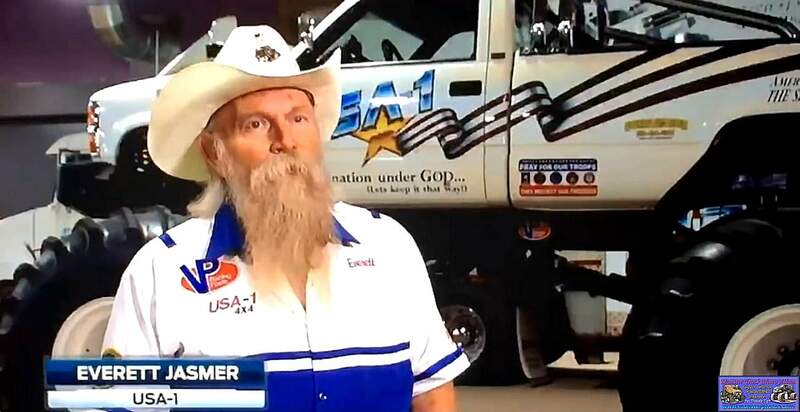 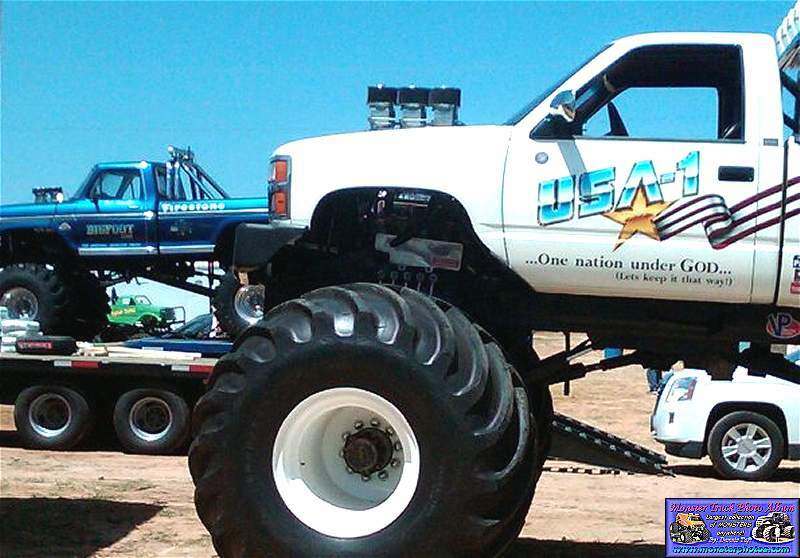 OWNER: Everett Jasmer of Spring Lake Park, Minn. 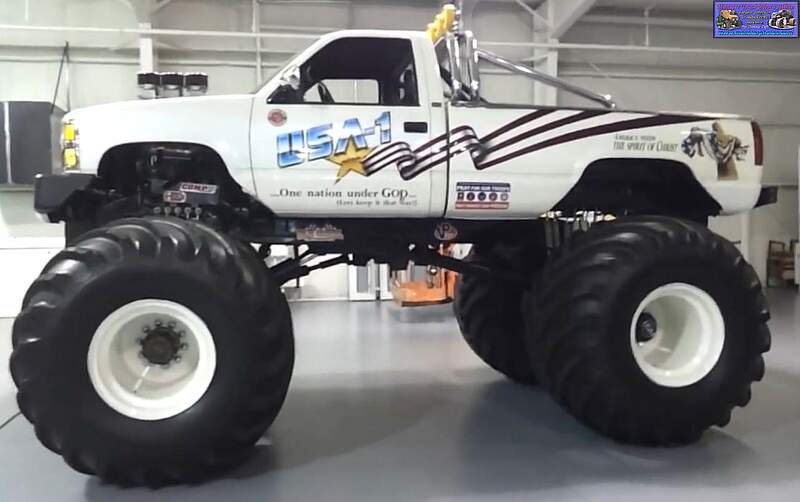 FEATURES: 5 KC Daylighters, Warn reflection front bumper, Warn winch, home built roll cage, roll bar, and on board fire extinguishers. 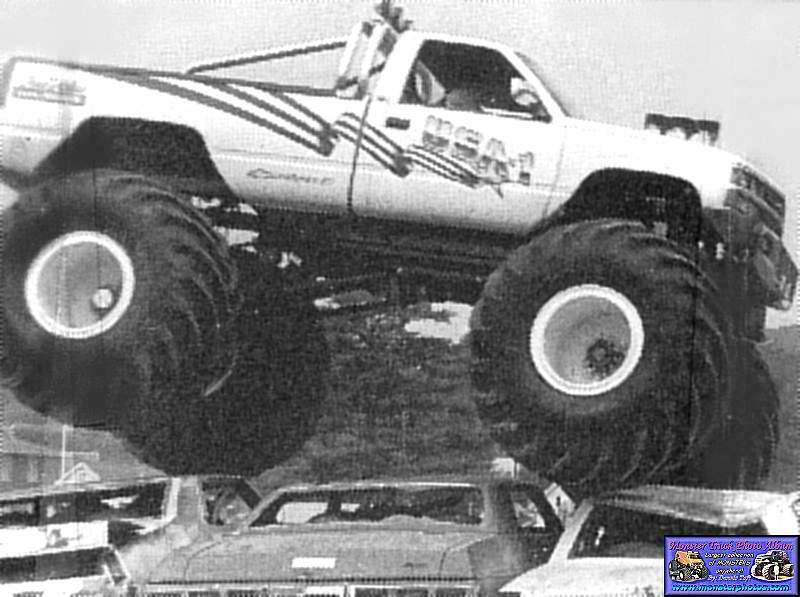 Mike Fussa sent me this picture. 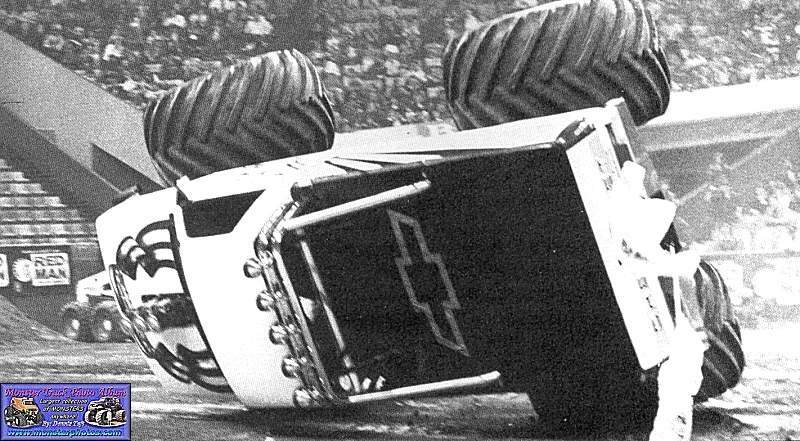 Liz Plecker sent me this shot. 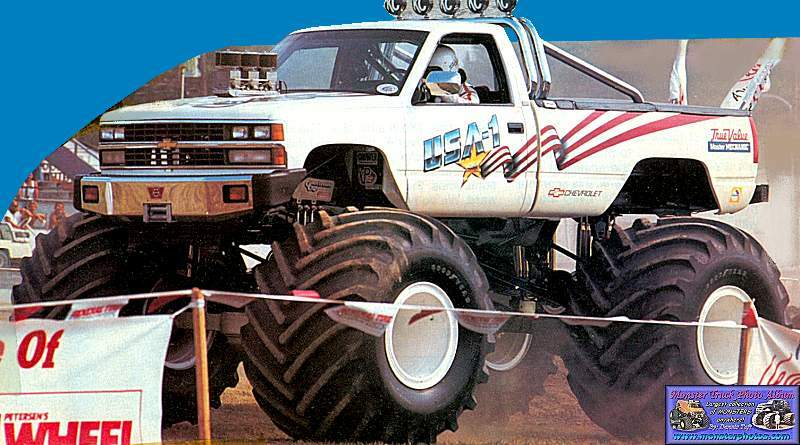 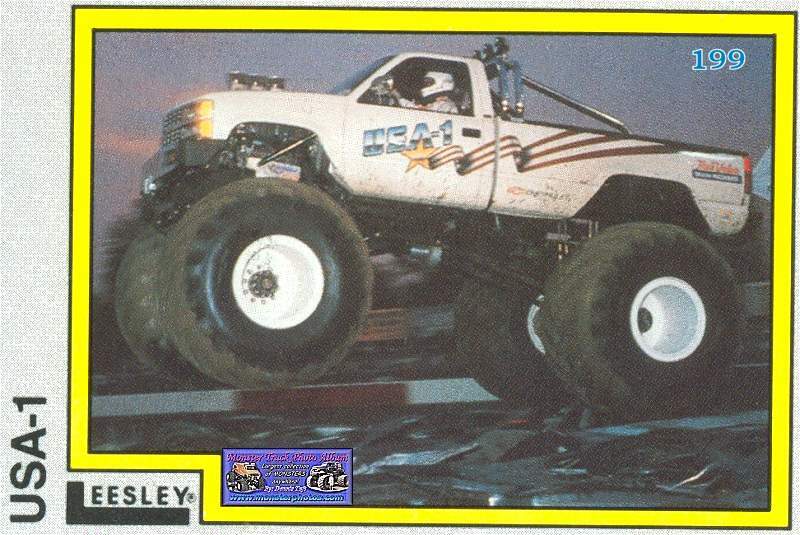 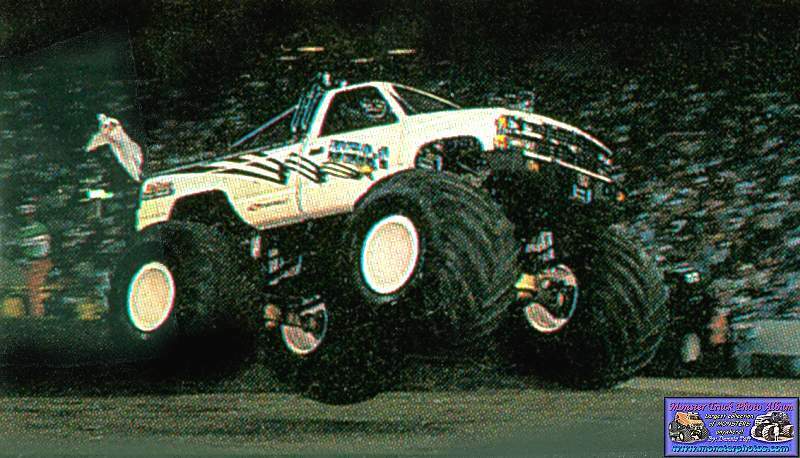 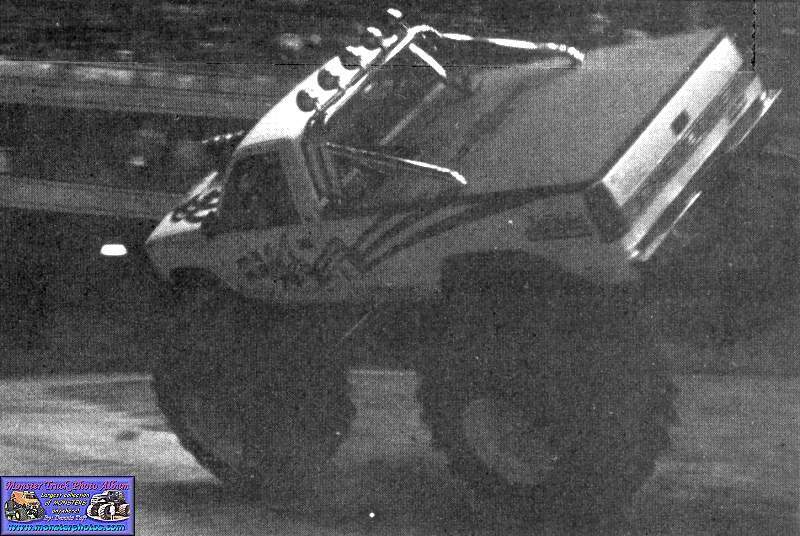 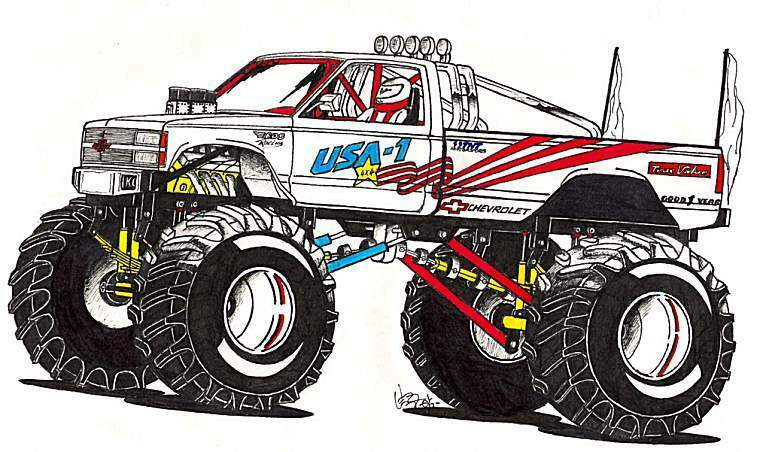 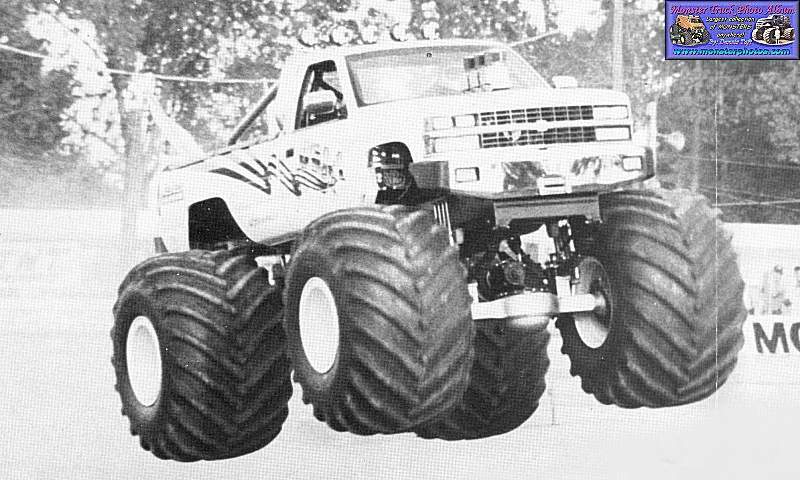 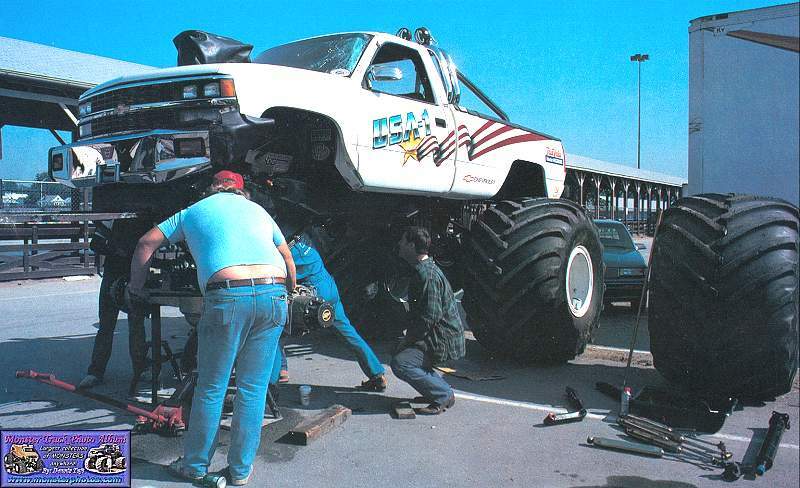 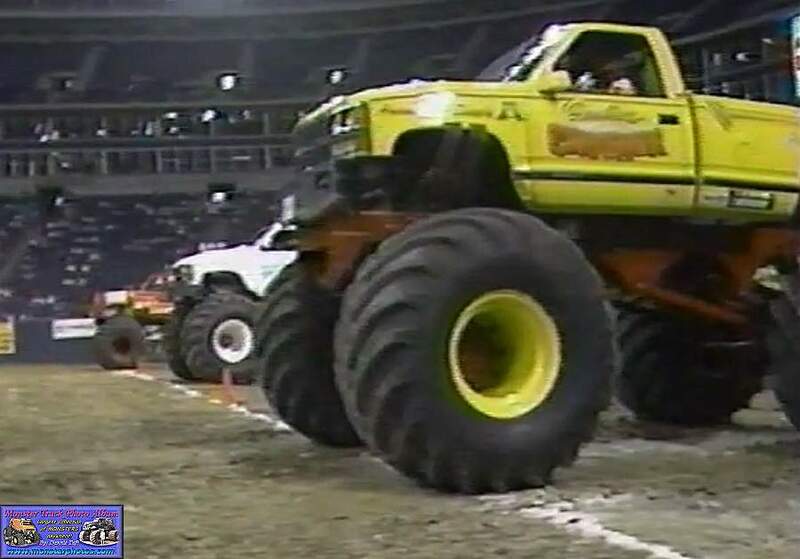 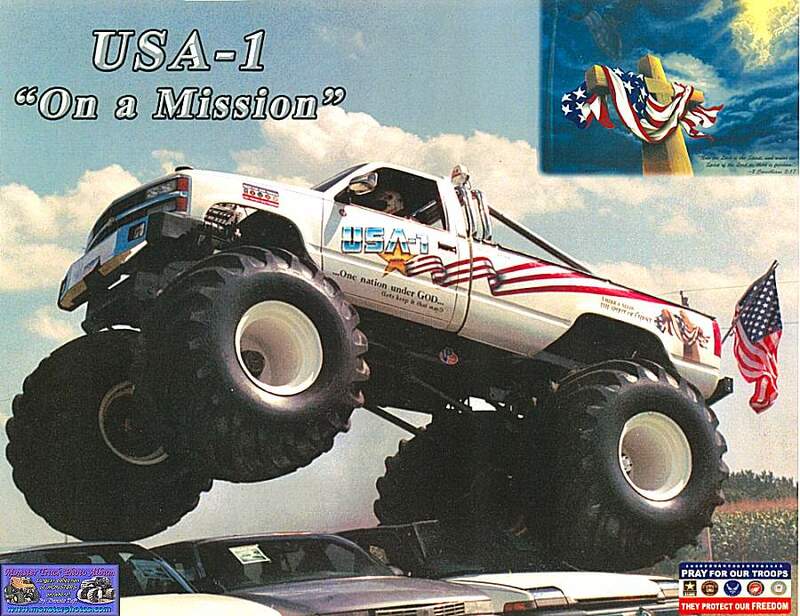 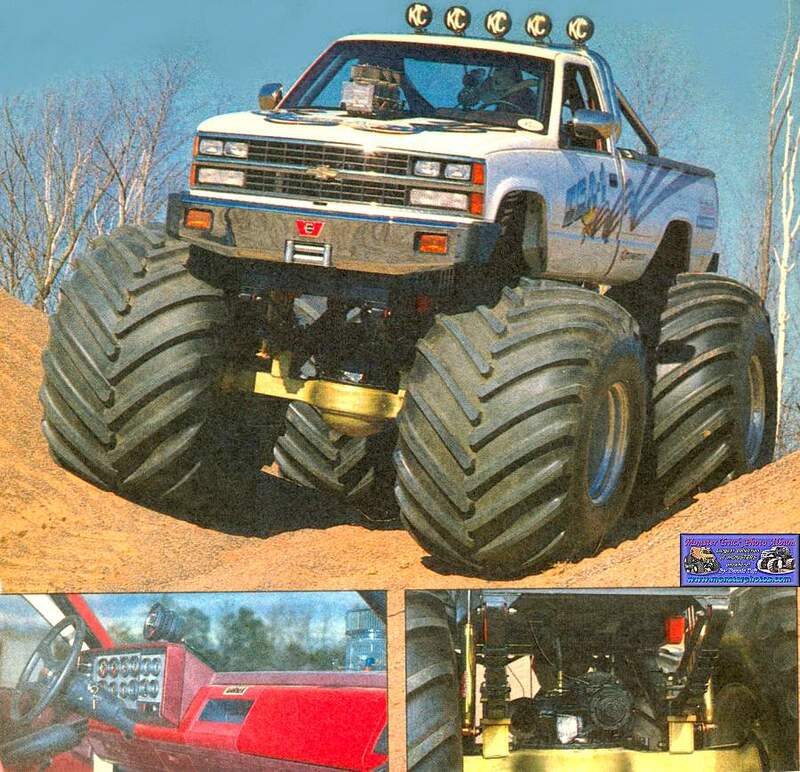 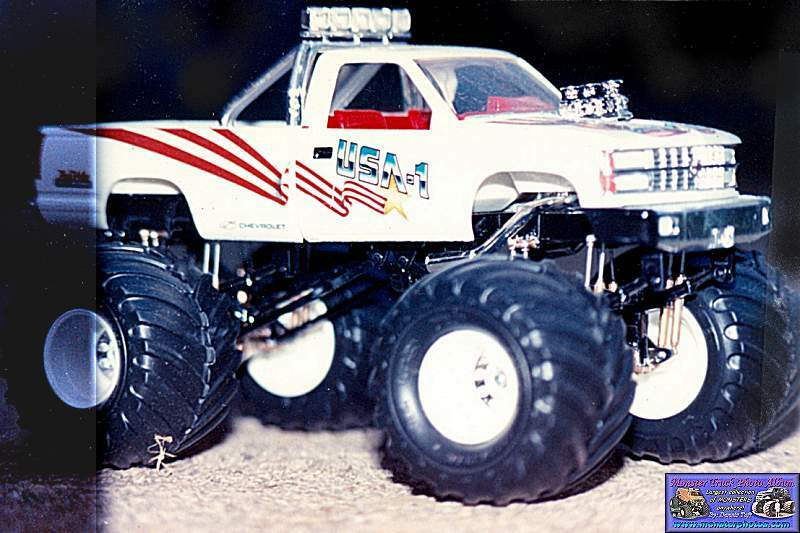 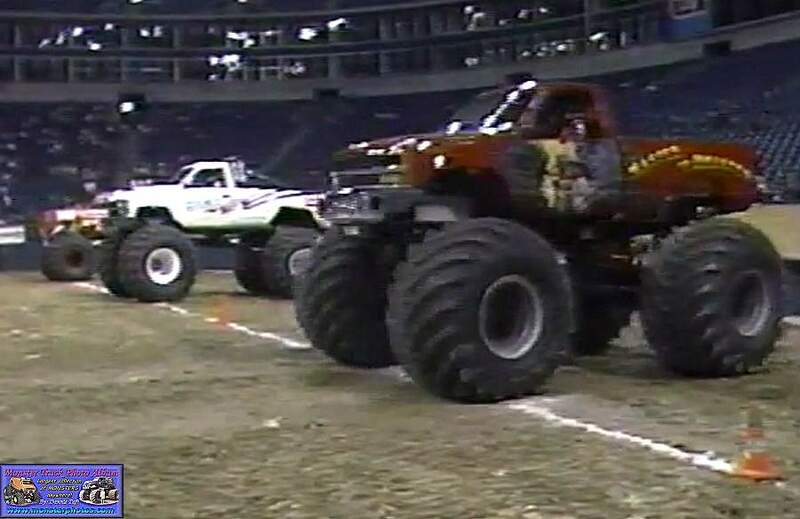 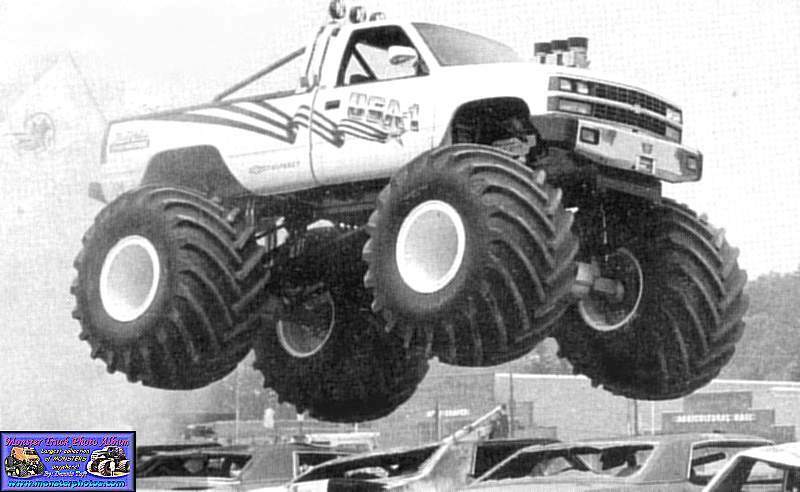 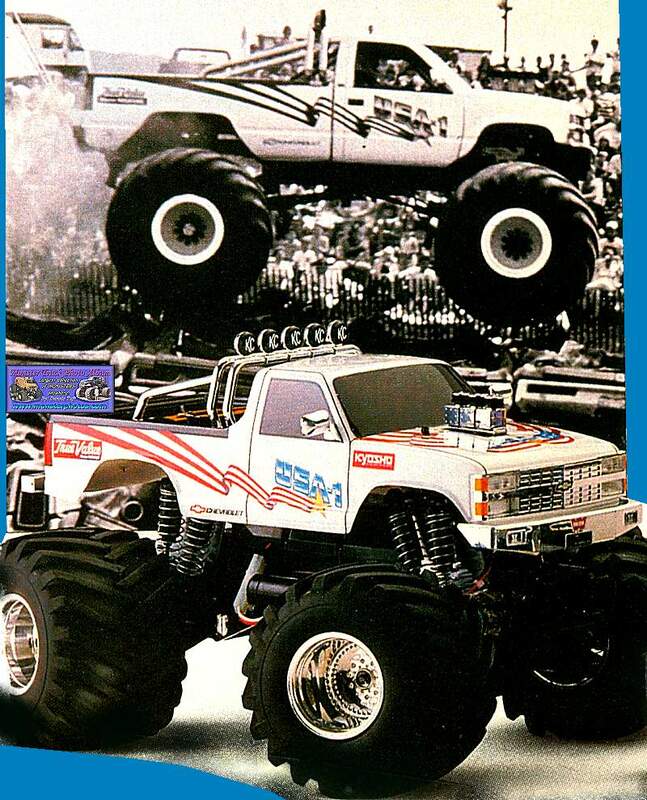 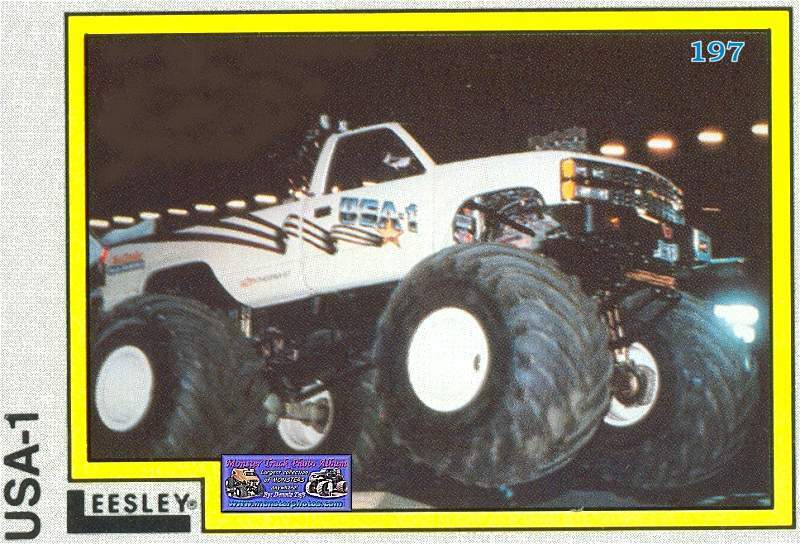 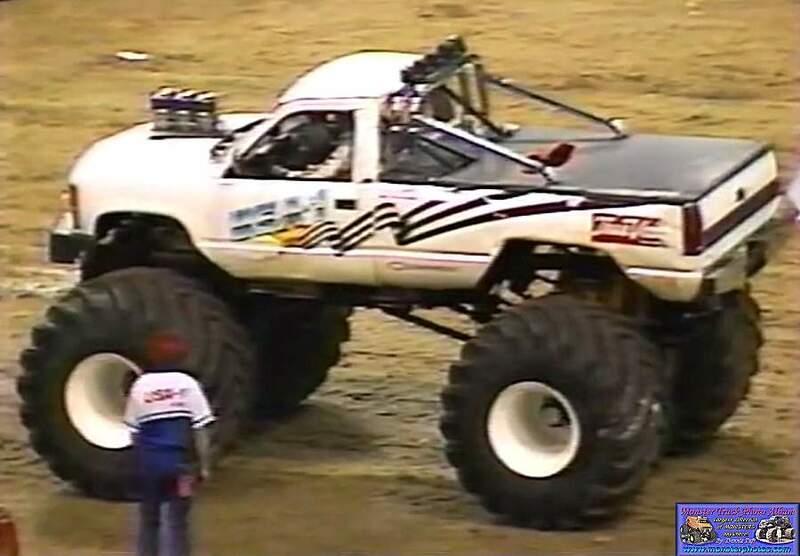 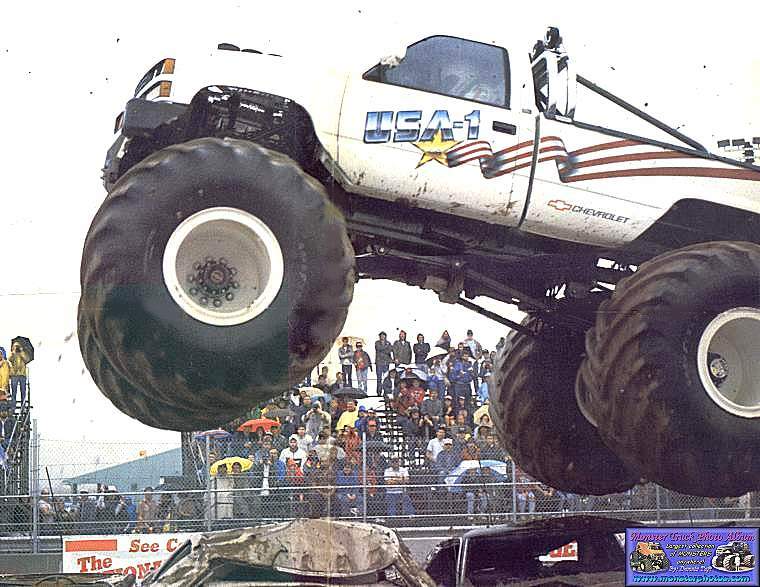 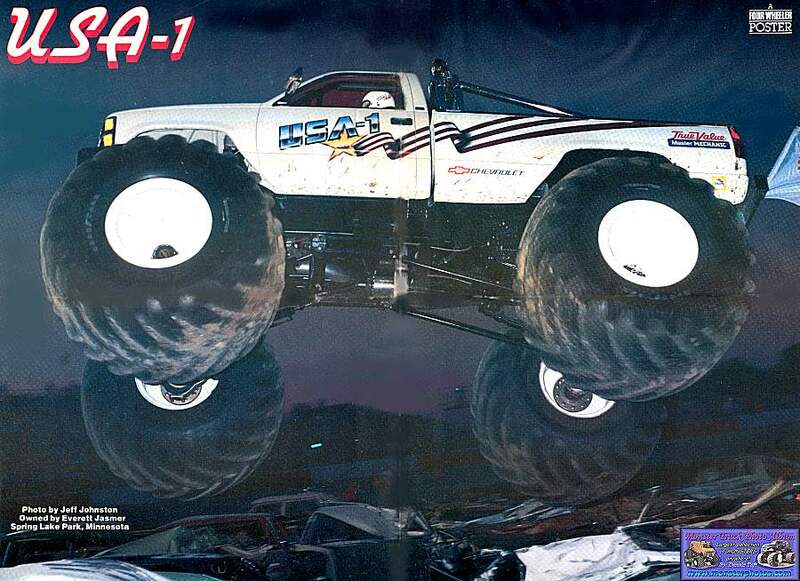 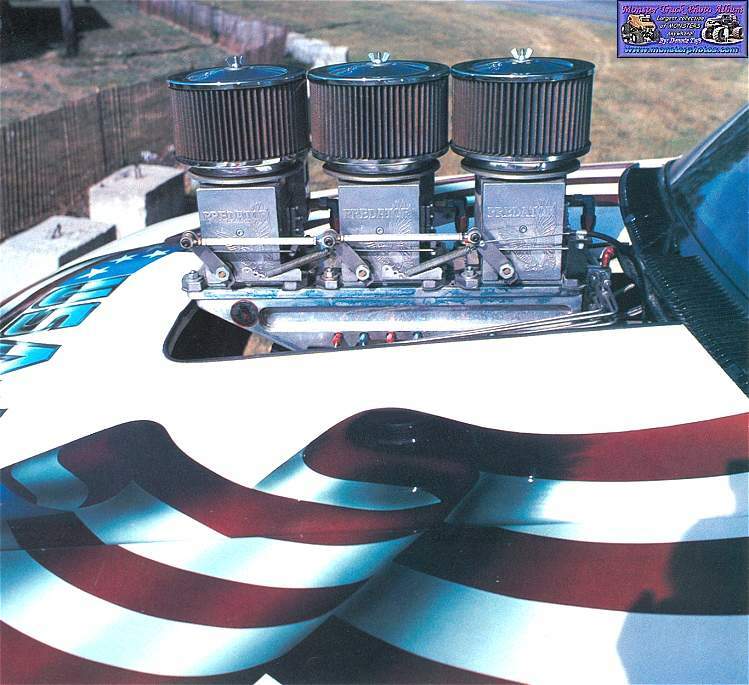 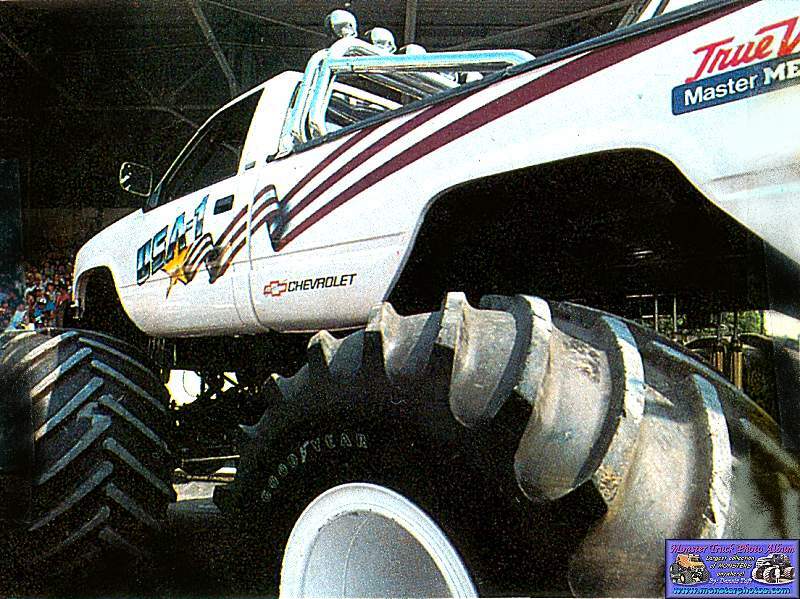 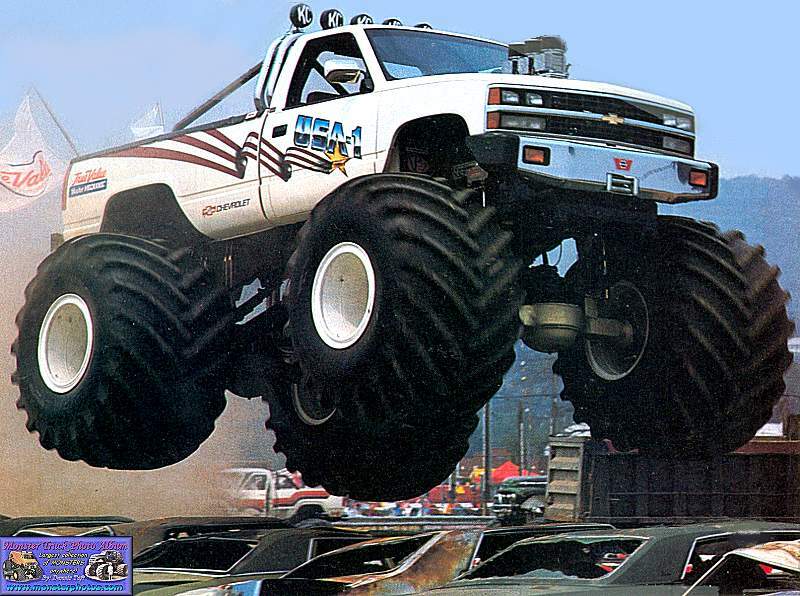 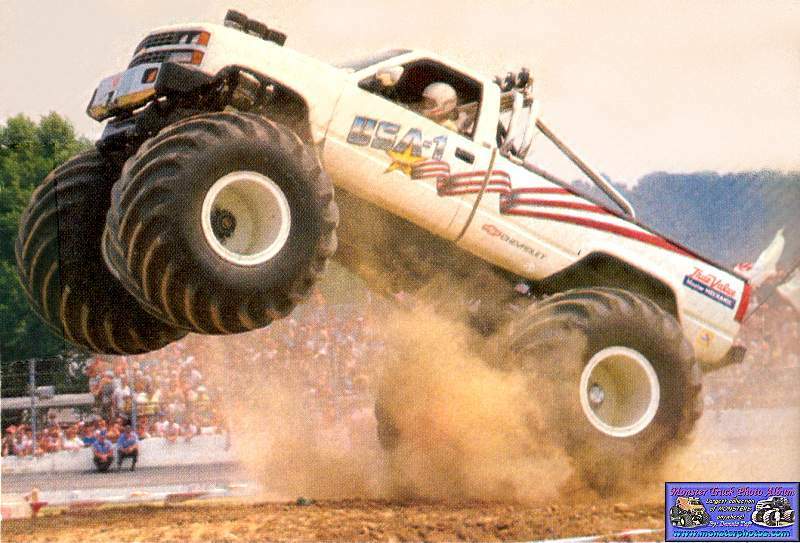 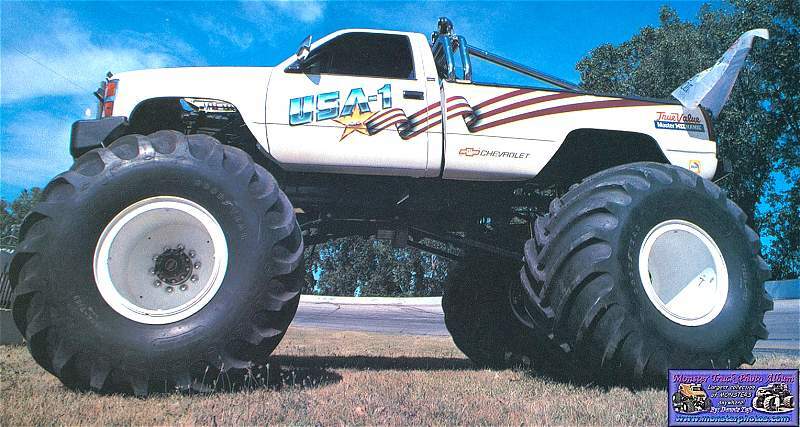 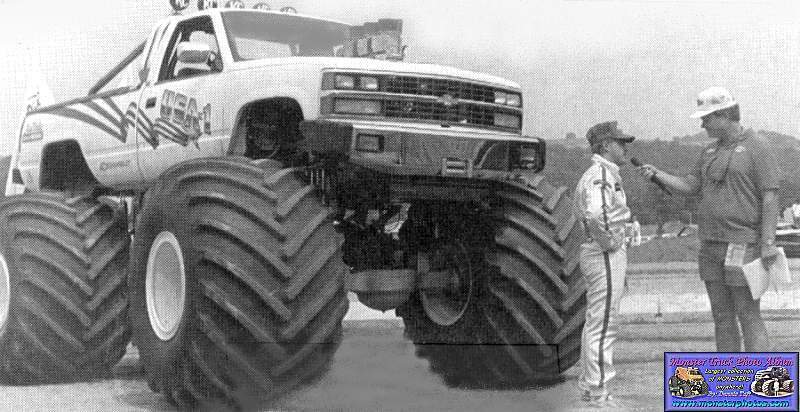 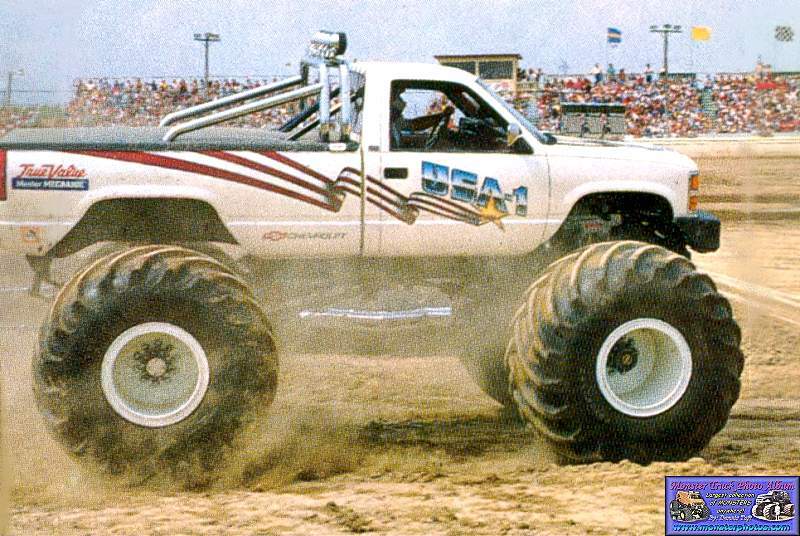 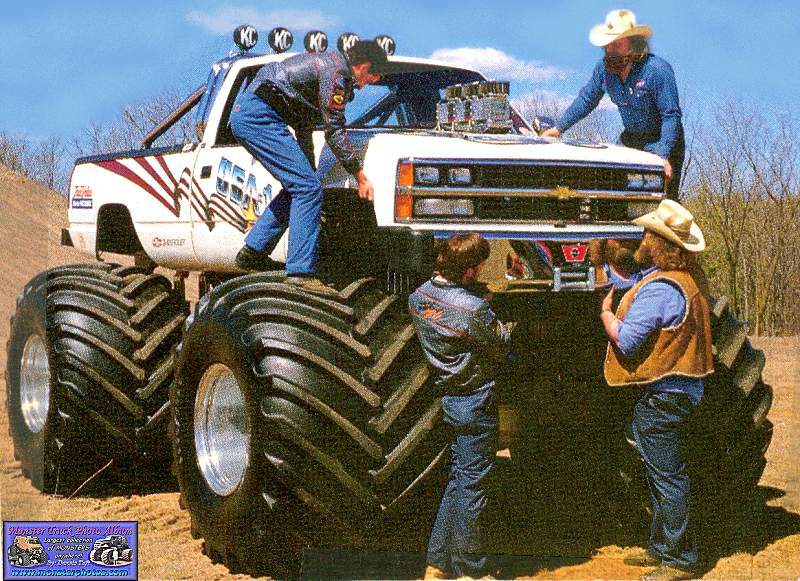 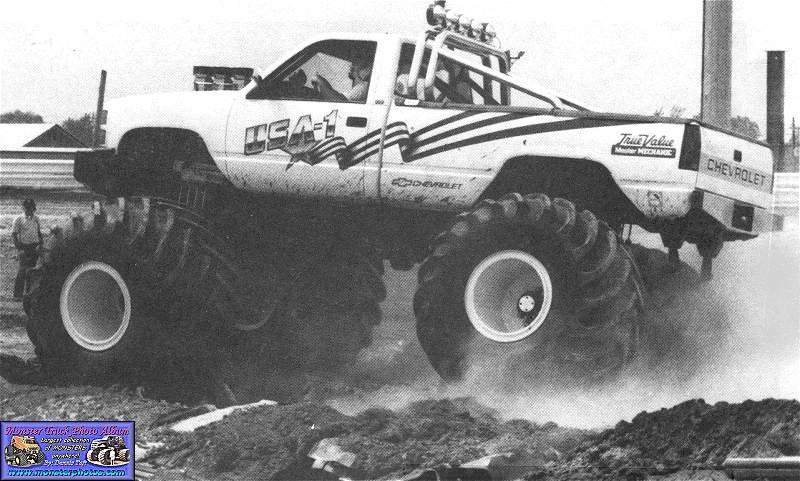 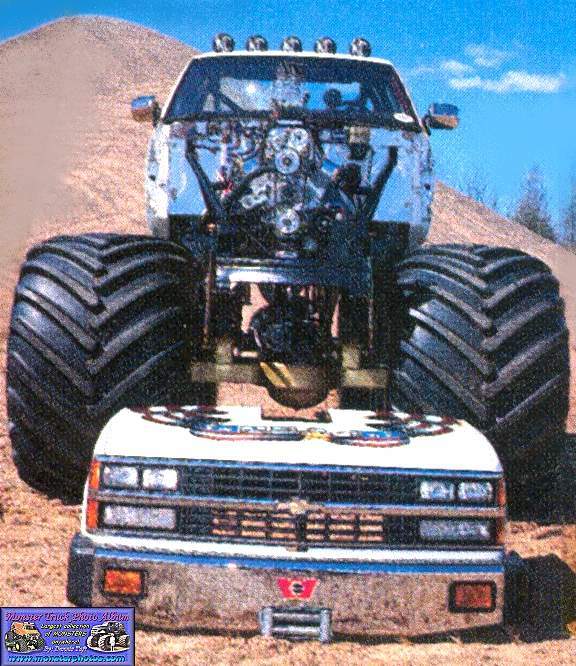 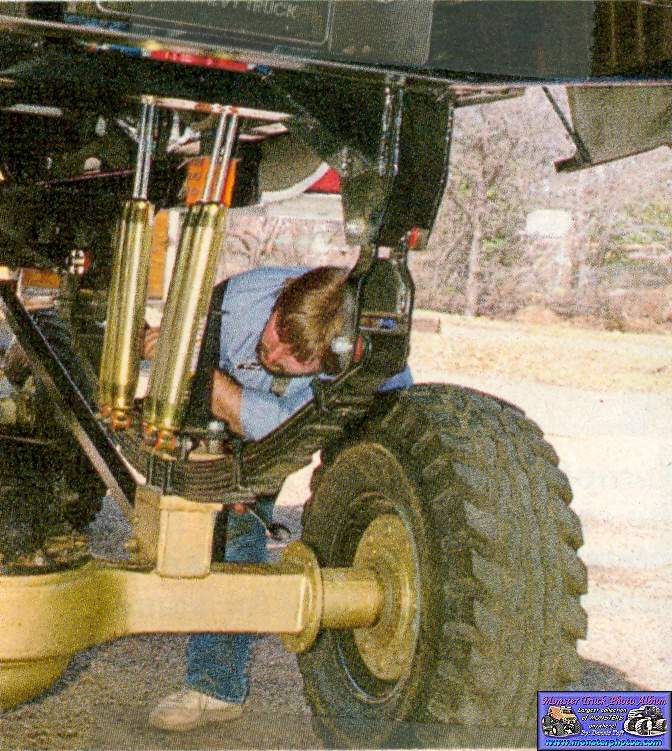 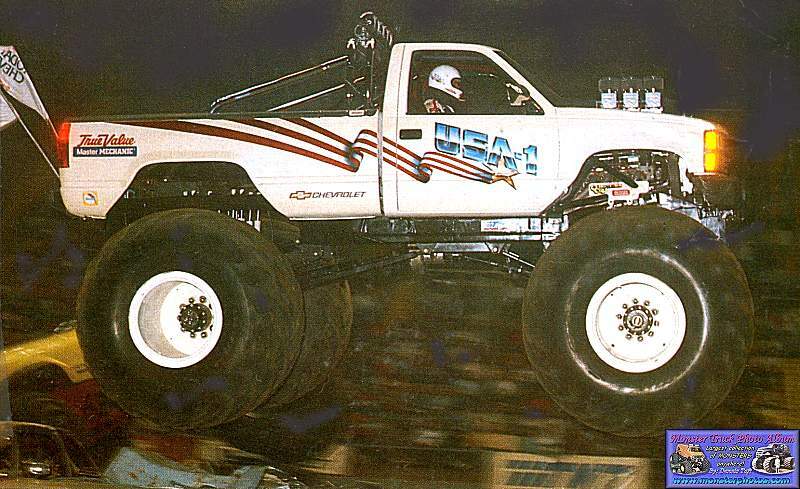 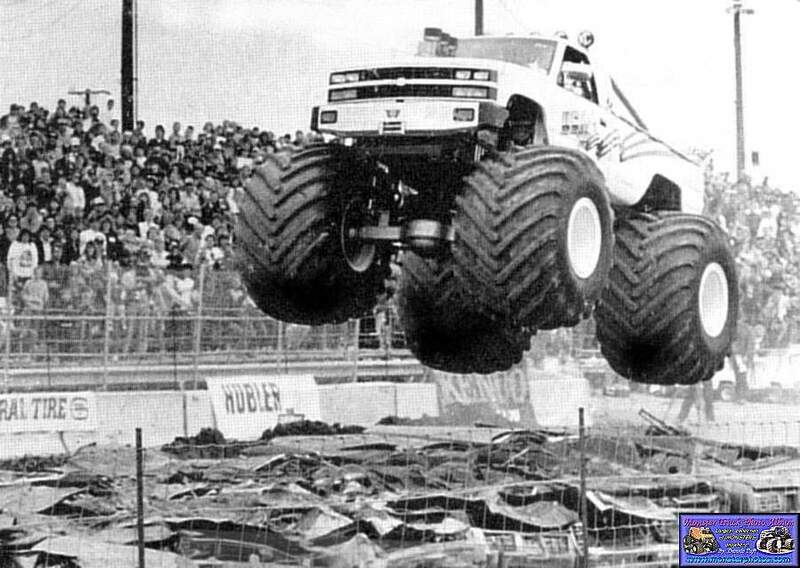 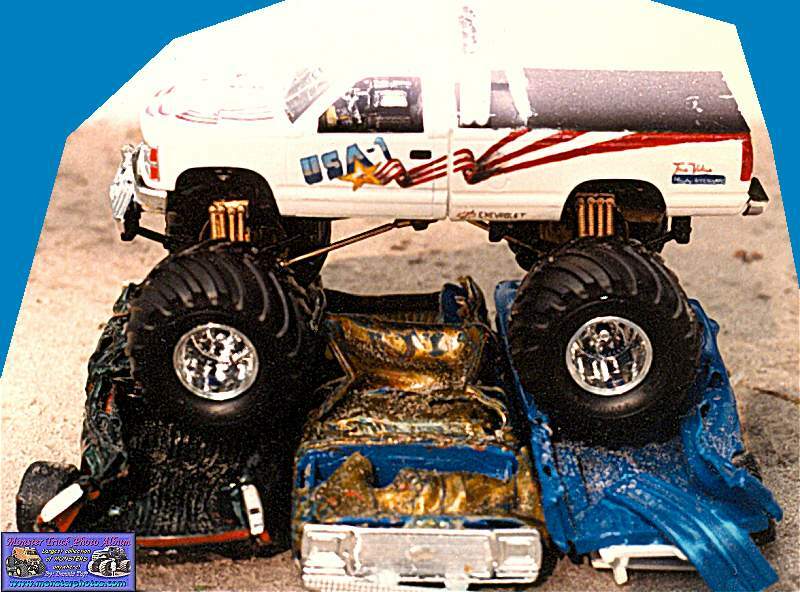 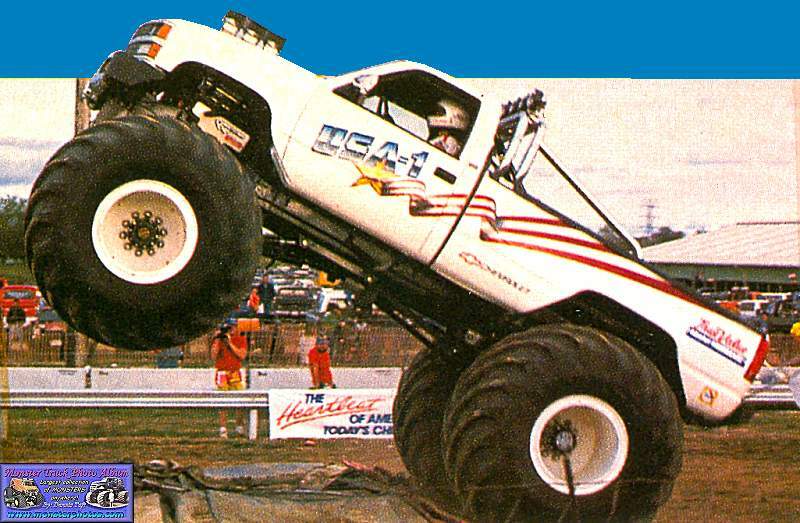 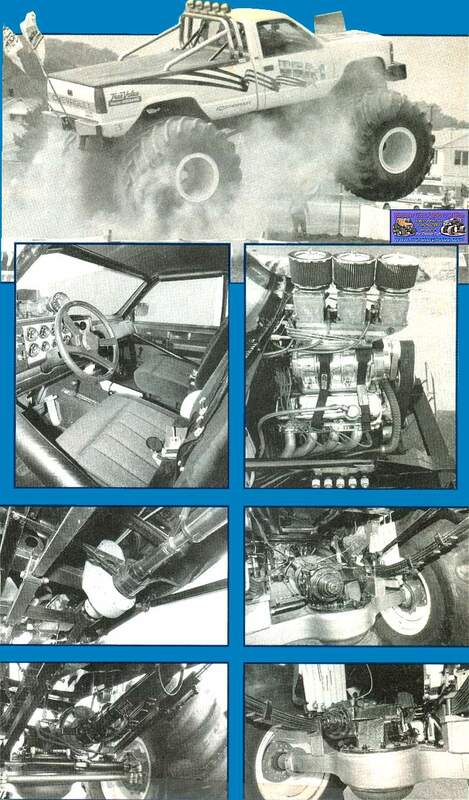 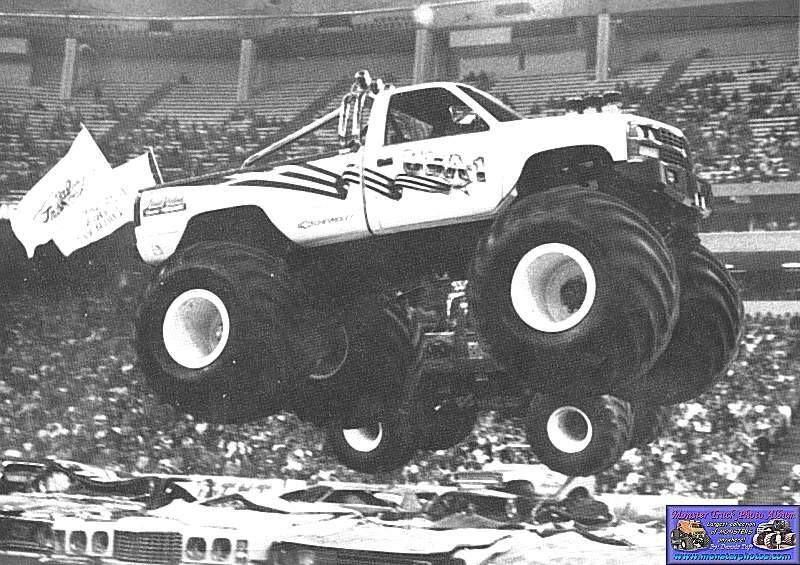 I scanned these 3 shots from Bill Holder's book "The Ultimate Book Of Monster Trucks". 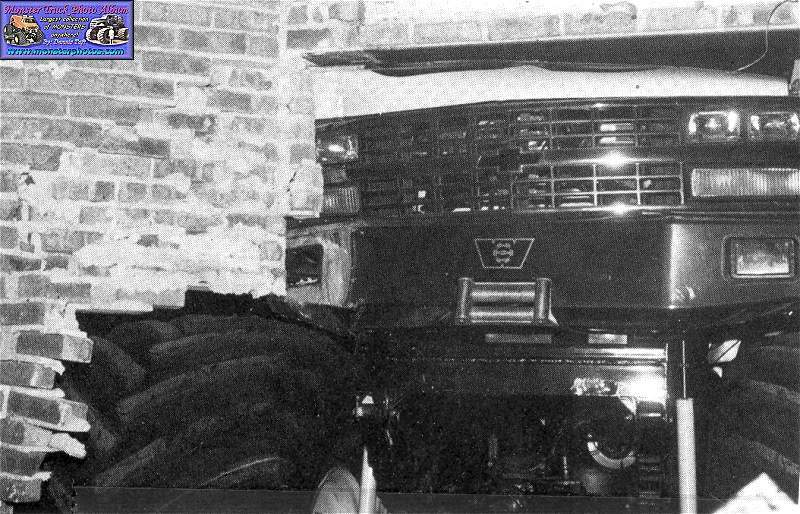 Photography by John D. Farquhar. 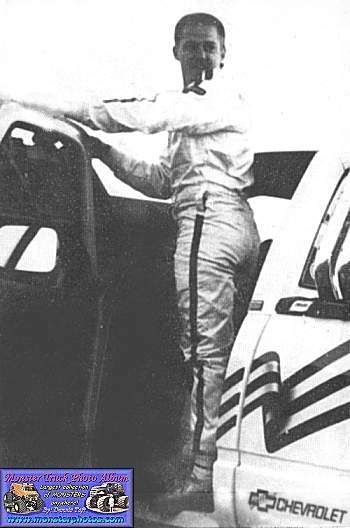 Luis Vera from Puerto Rico. 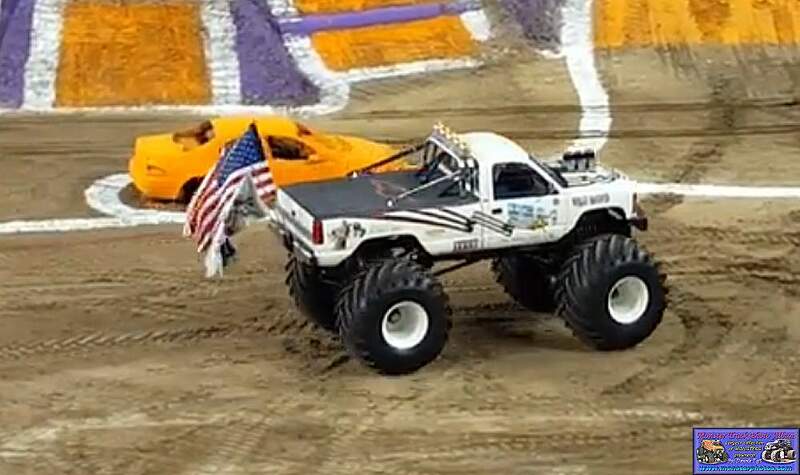 I reside in Orlando, FL. 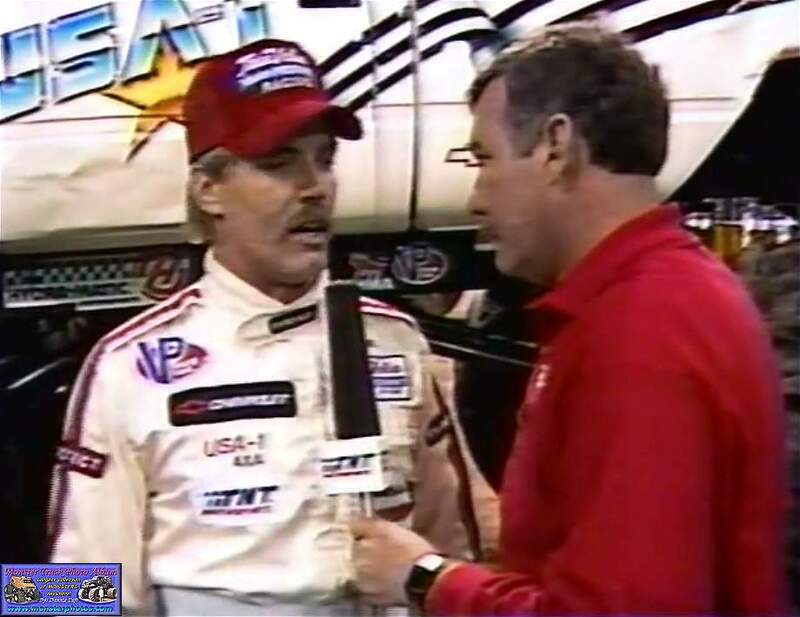 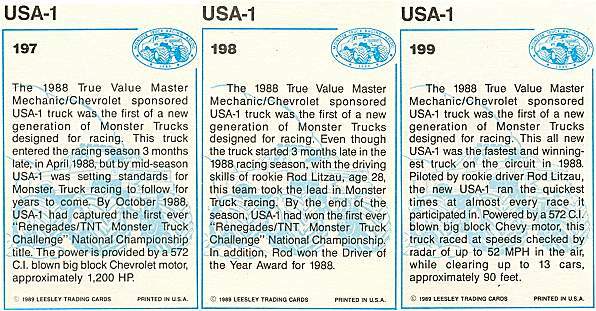 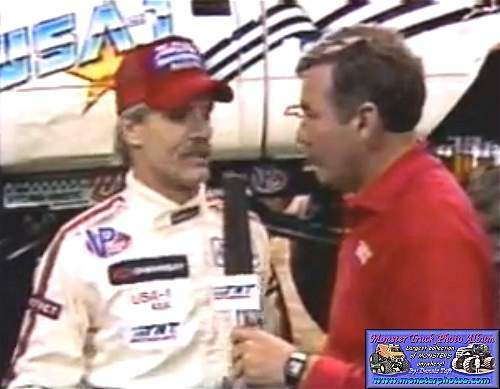 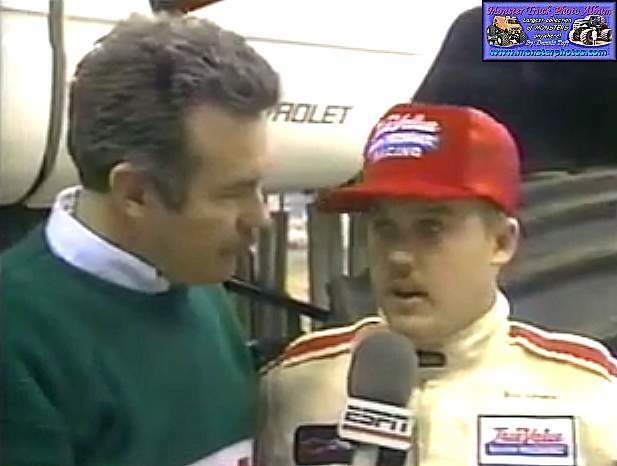 USA-1 flipped while capturing the 1988 points championship. 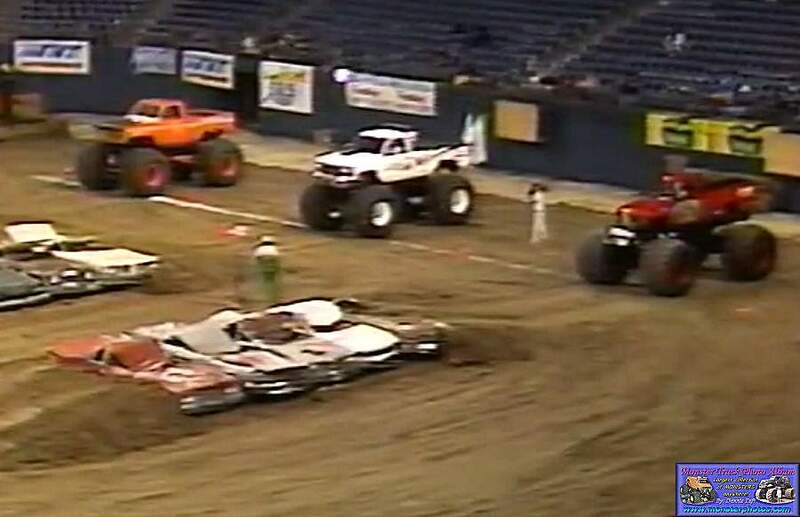 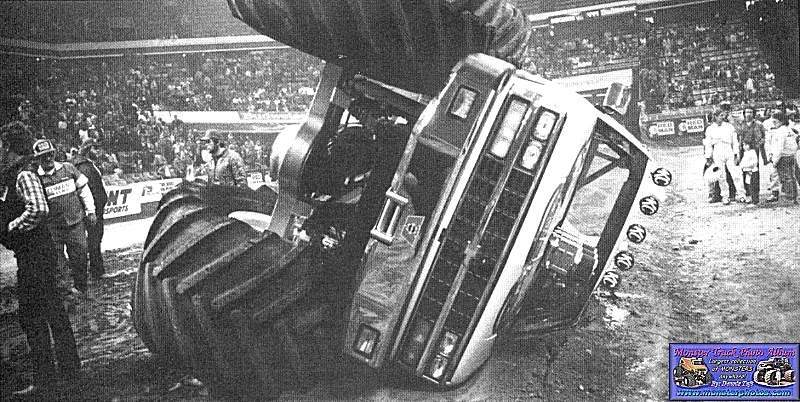 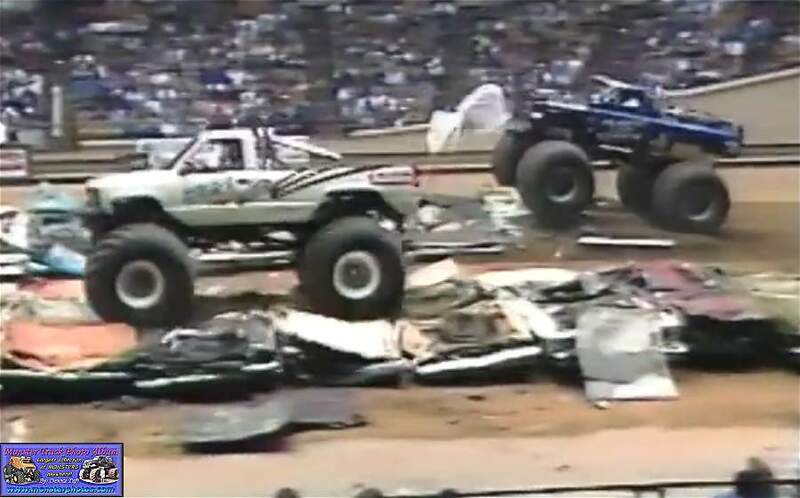 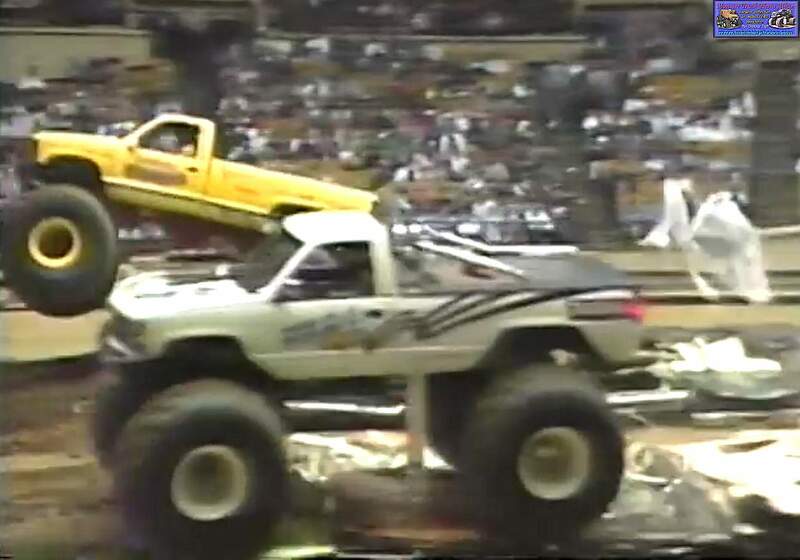 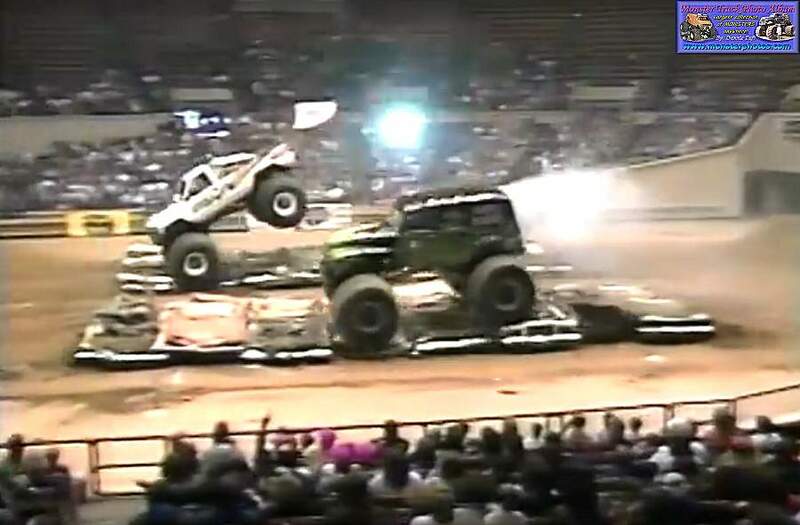 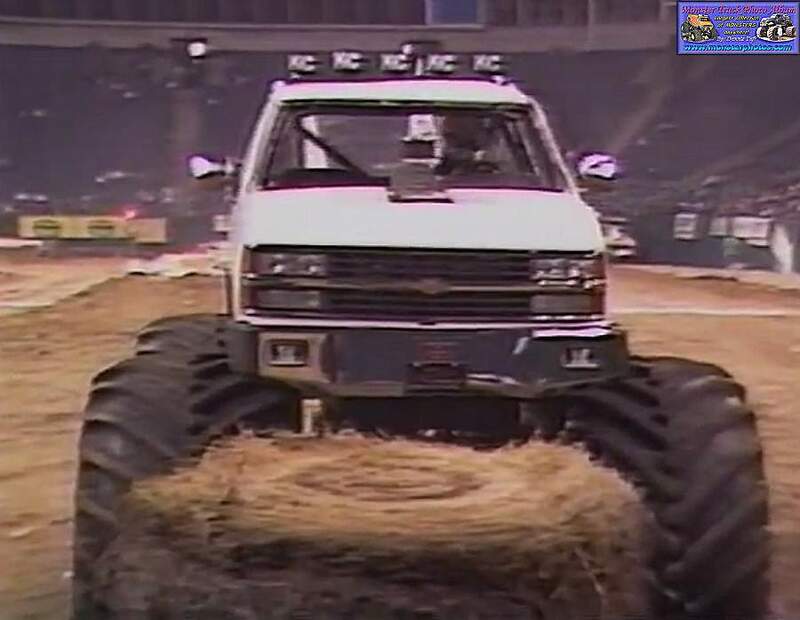 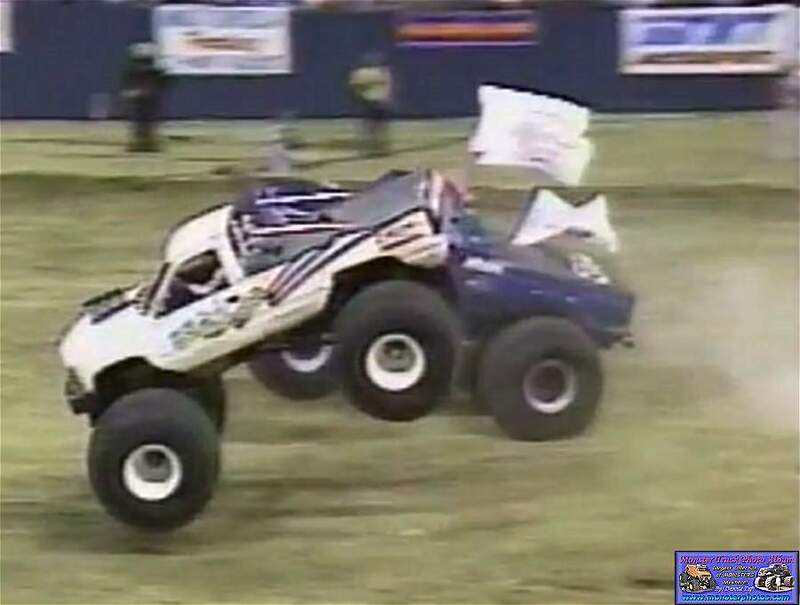 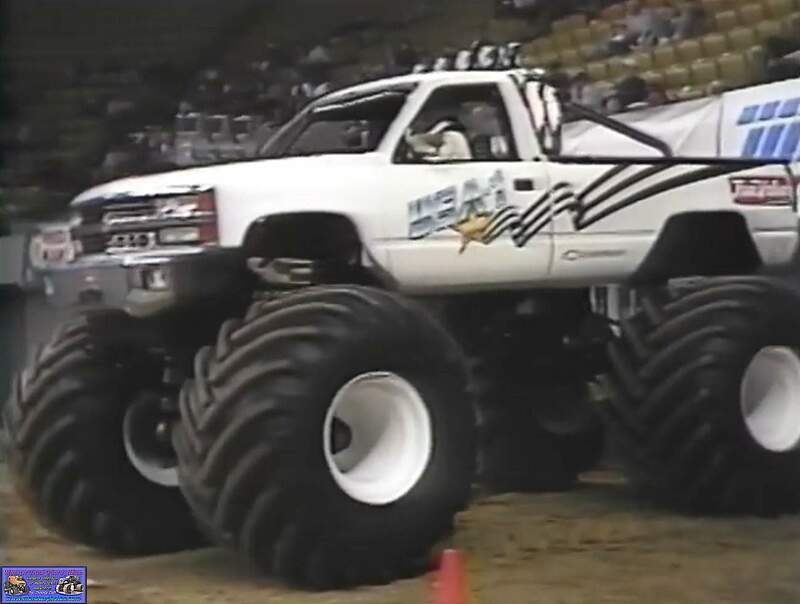 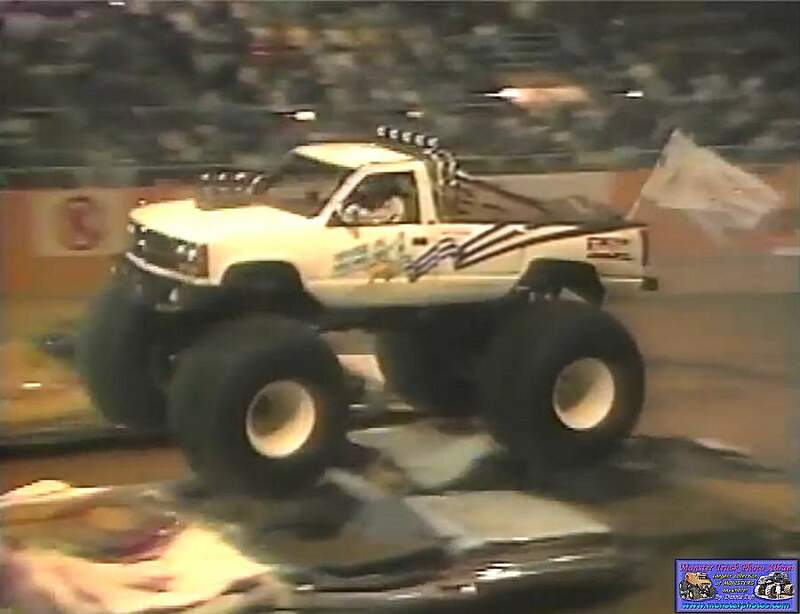 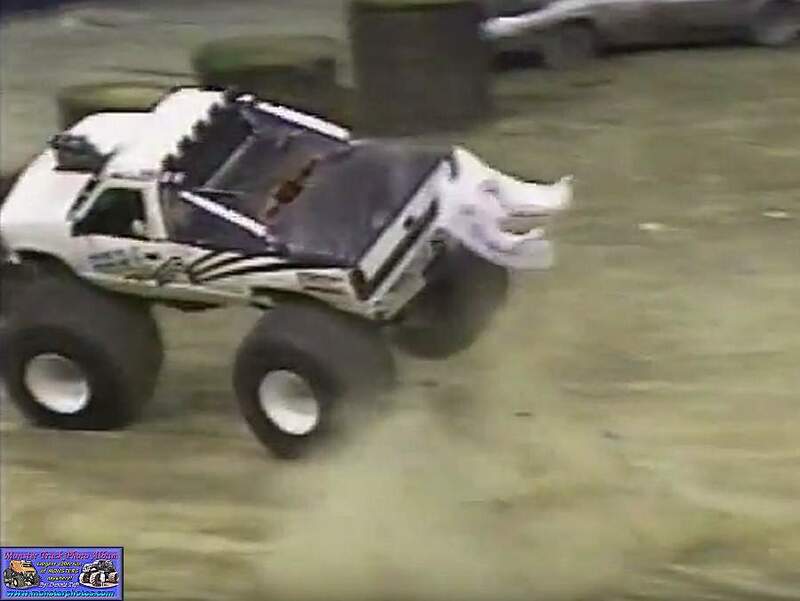 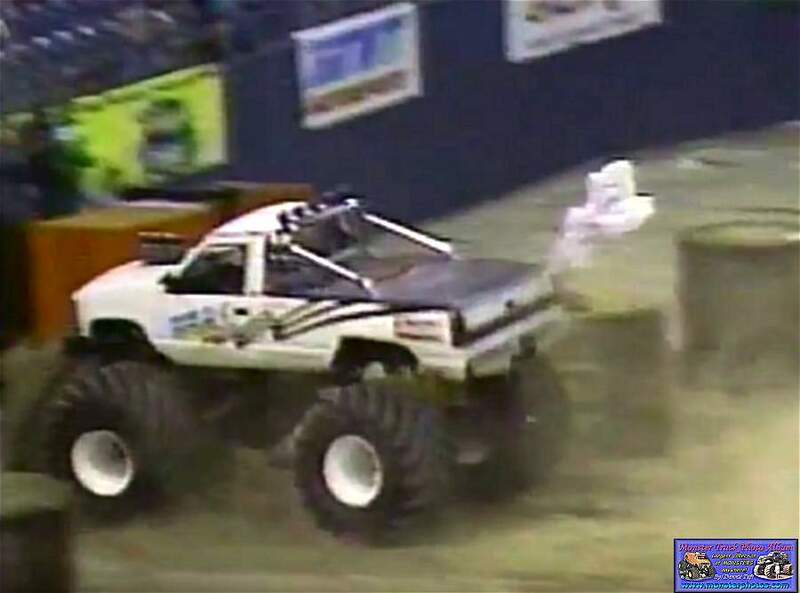 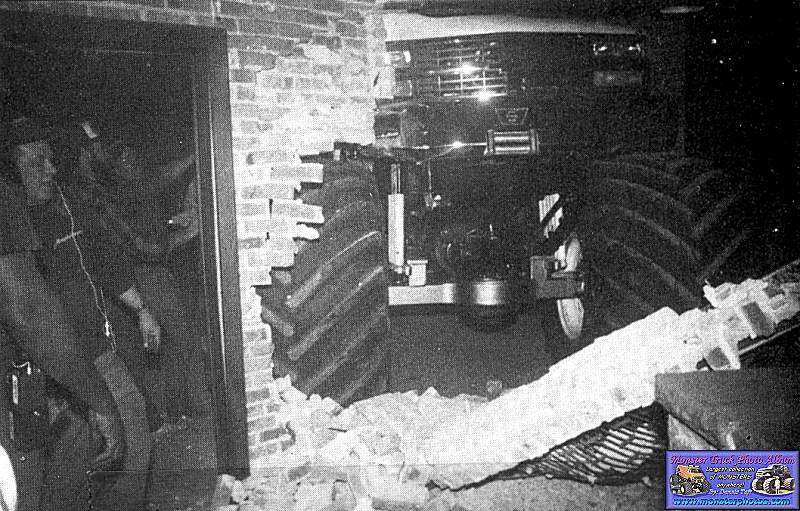 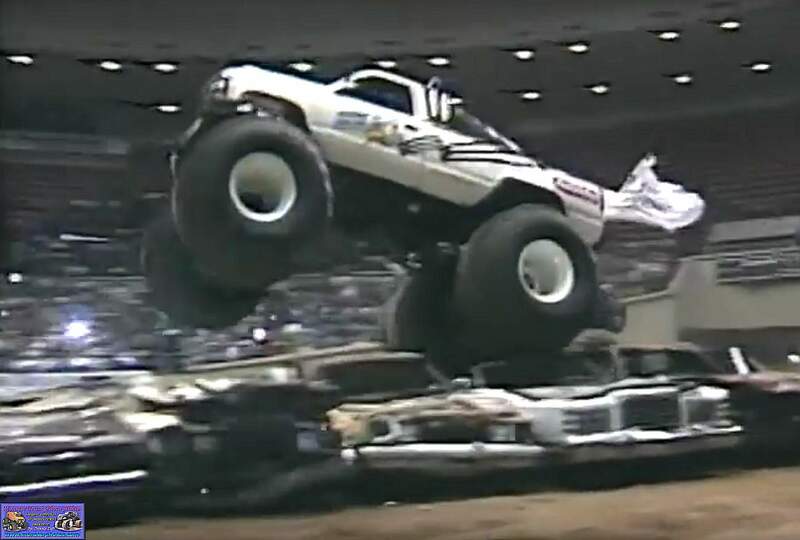 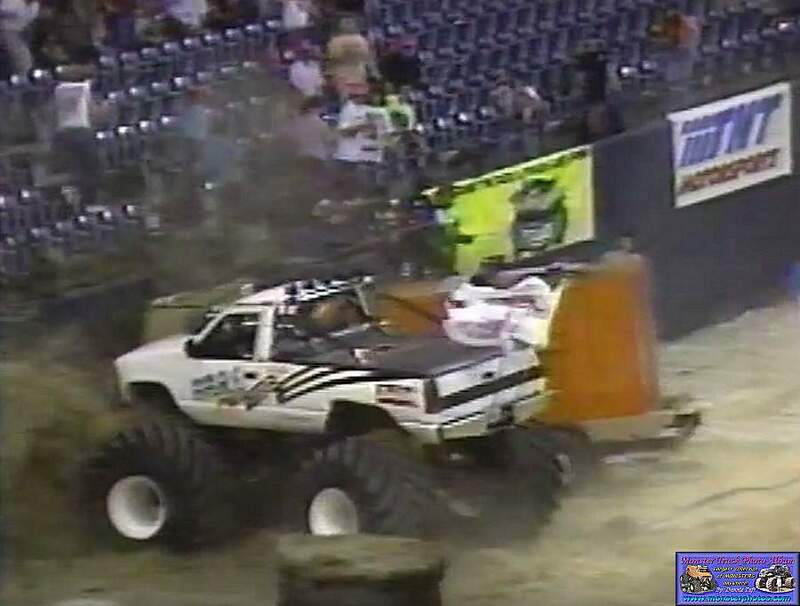 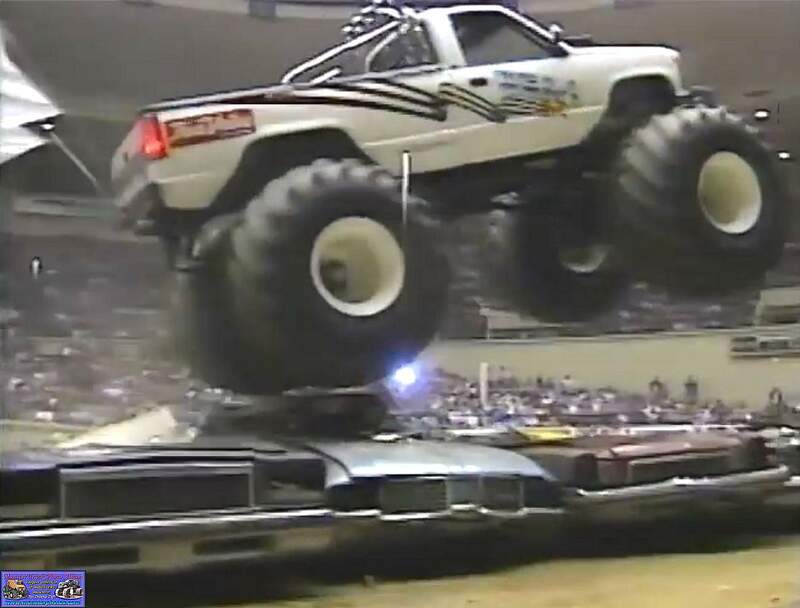 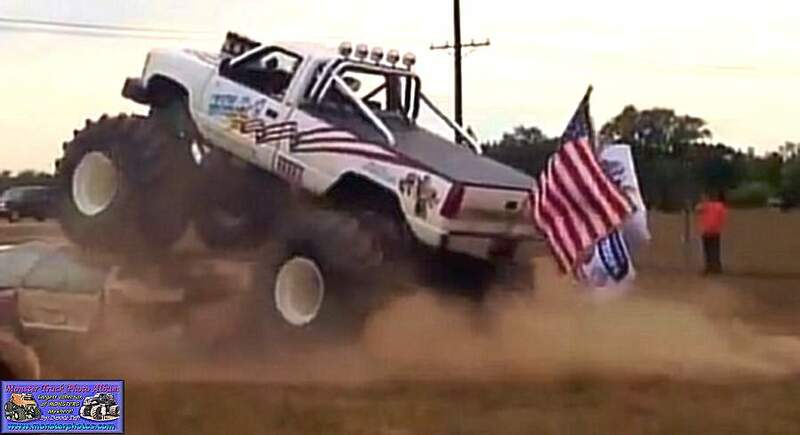 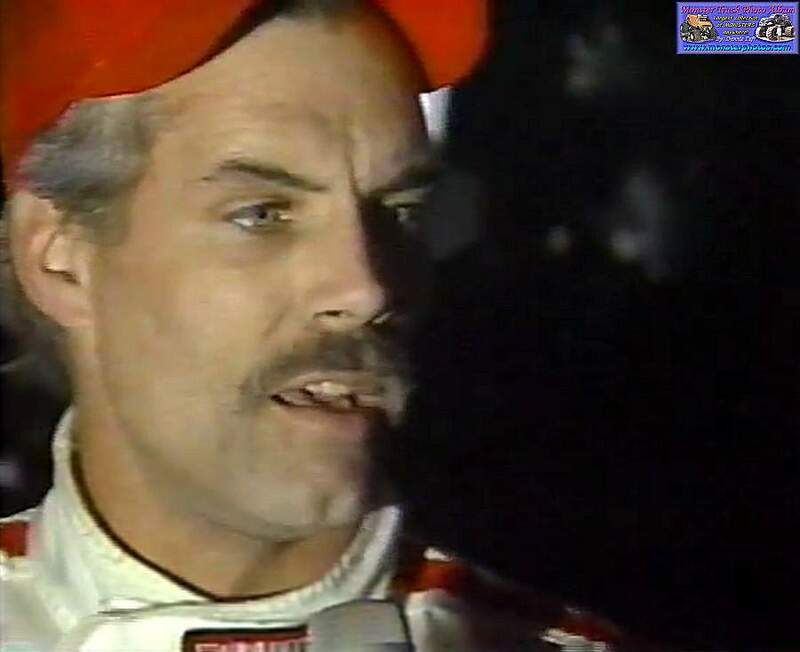 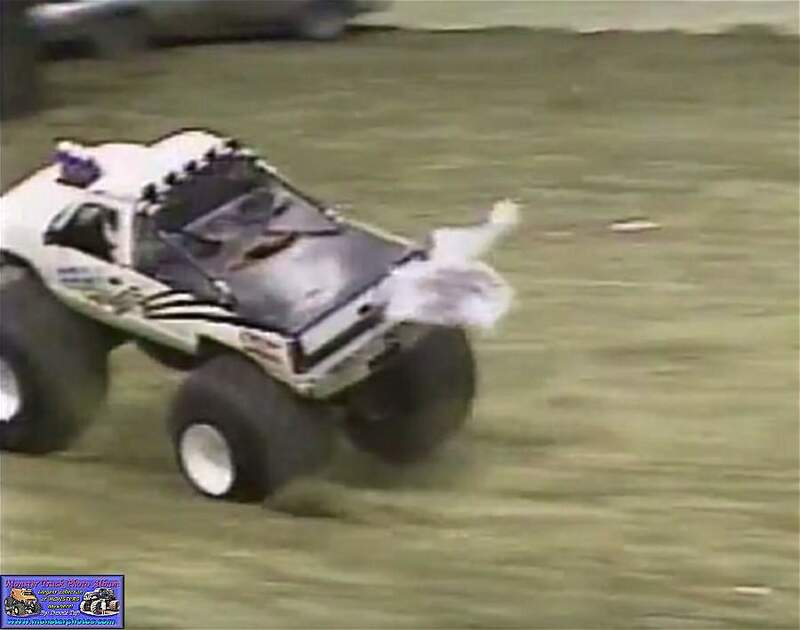 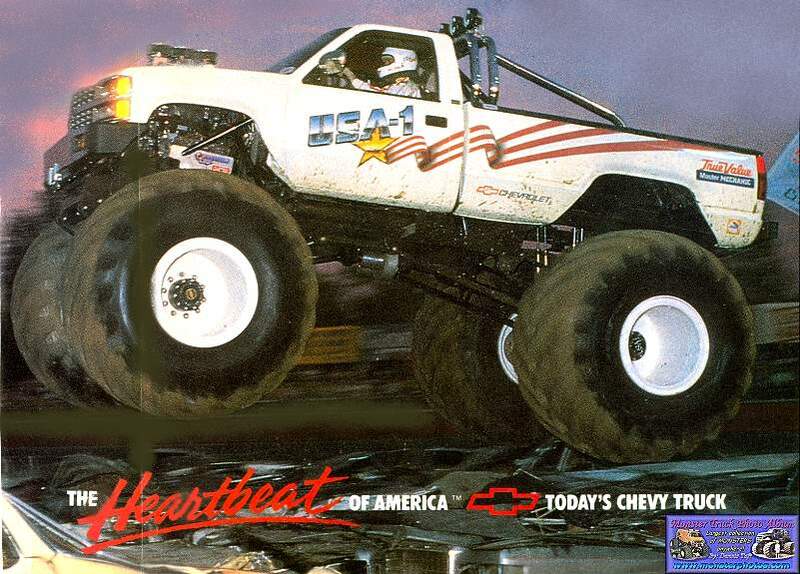 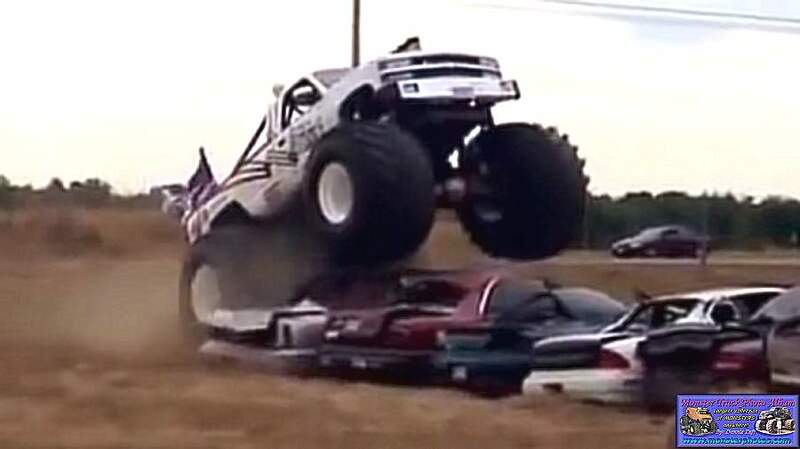 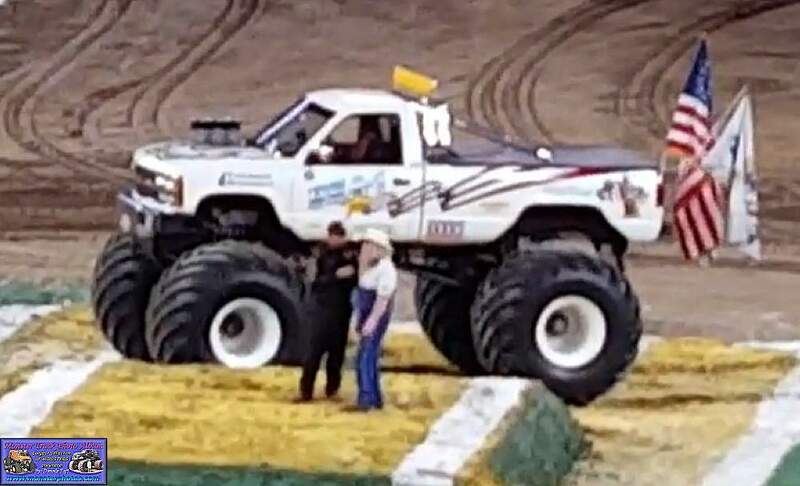 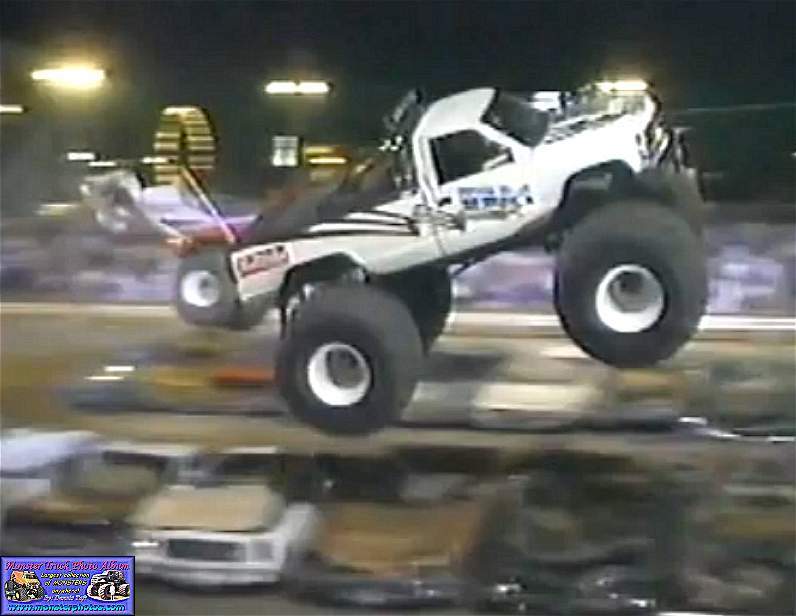 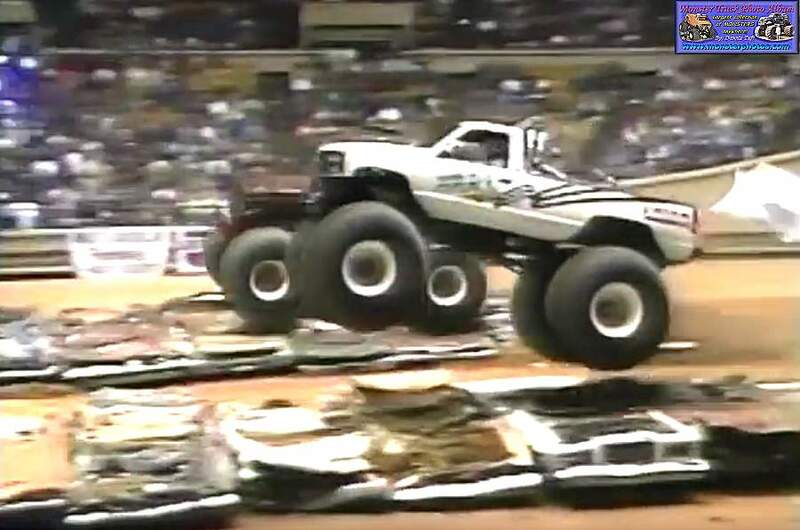 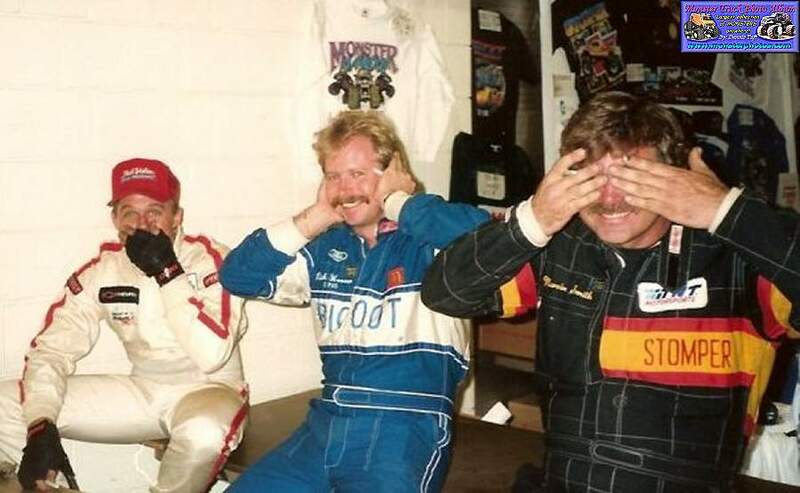 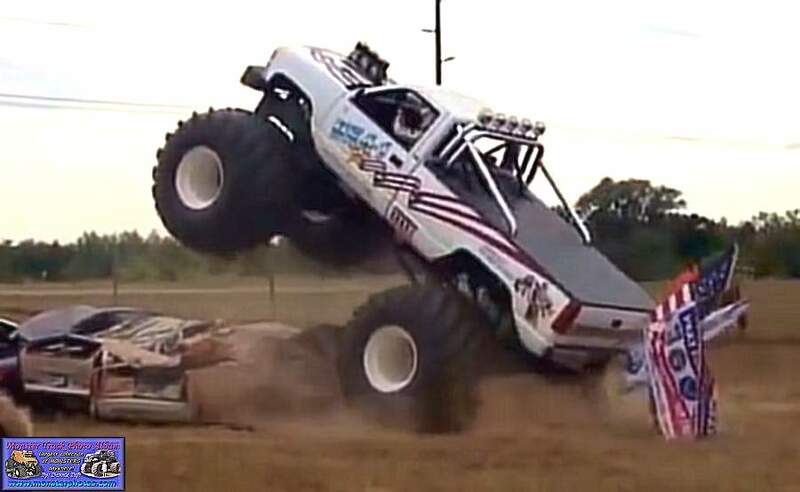 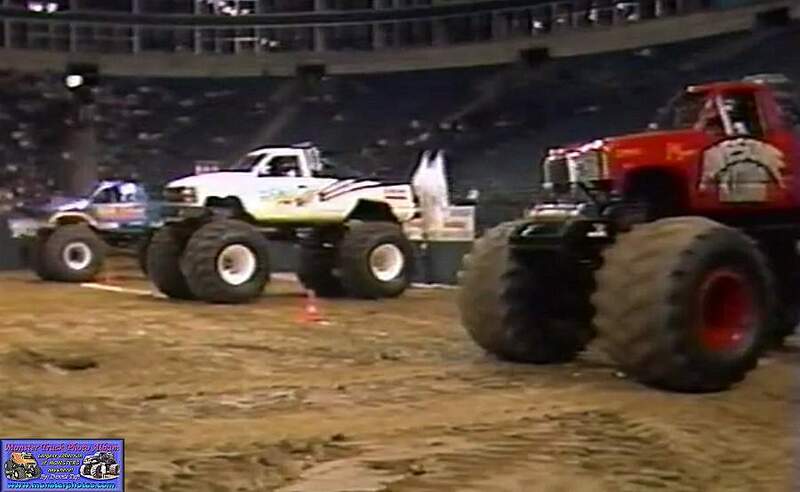 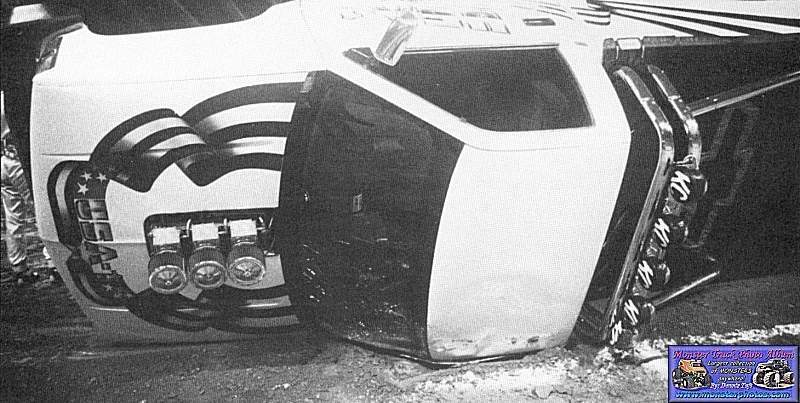 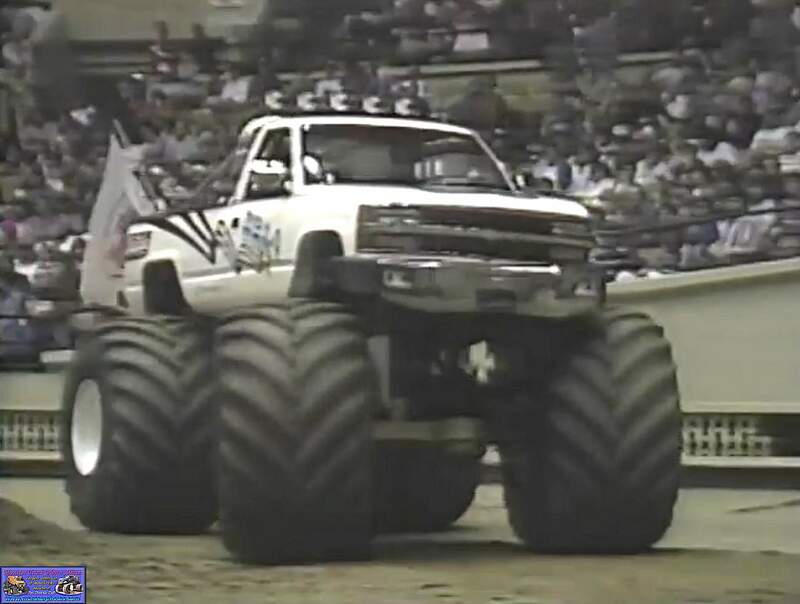 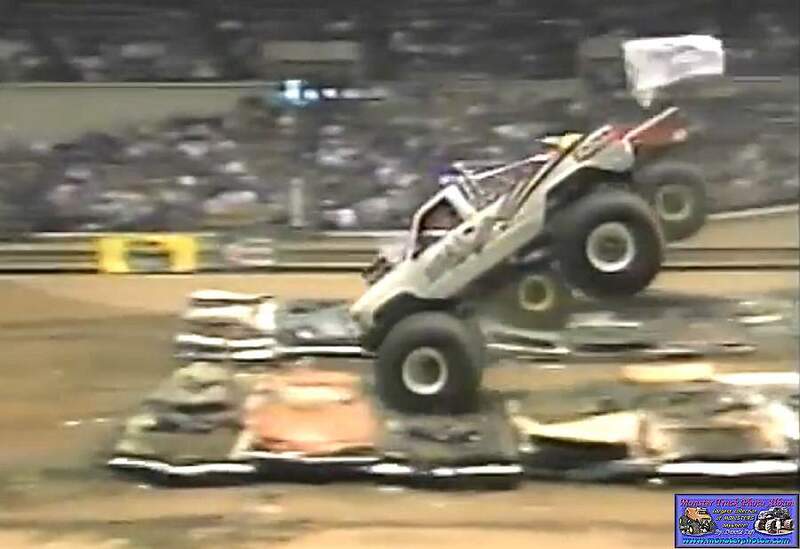 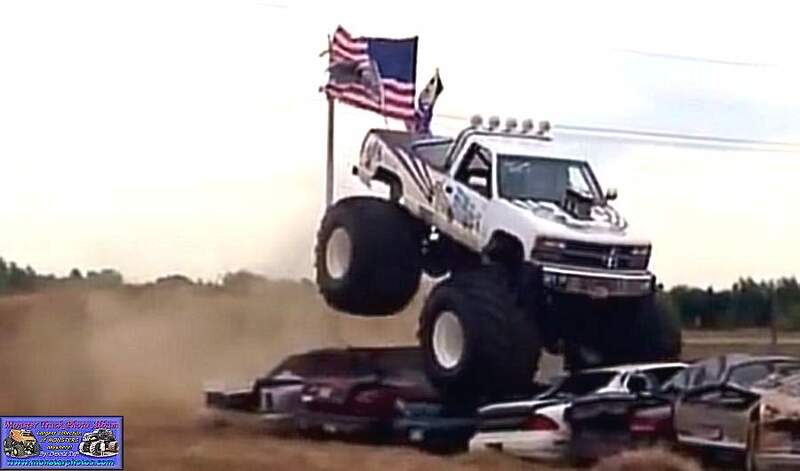 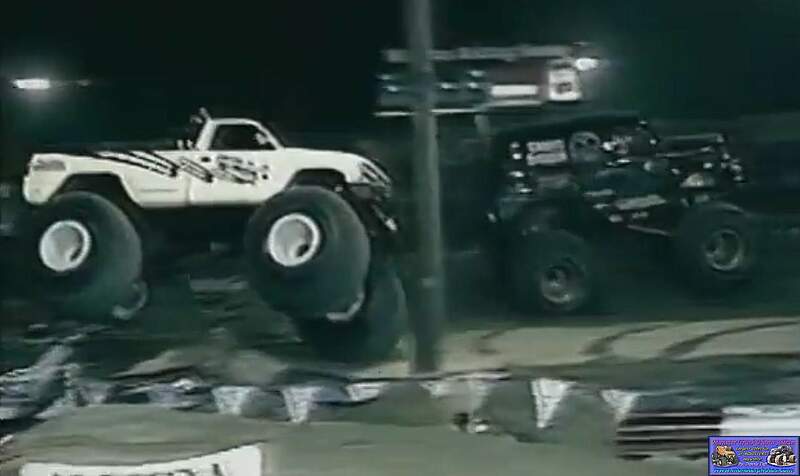 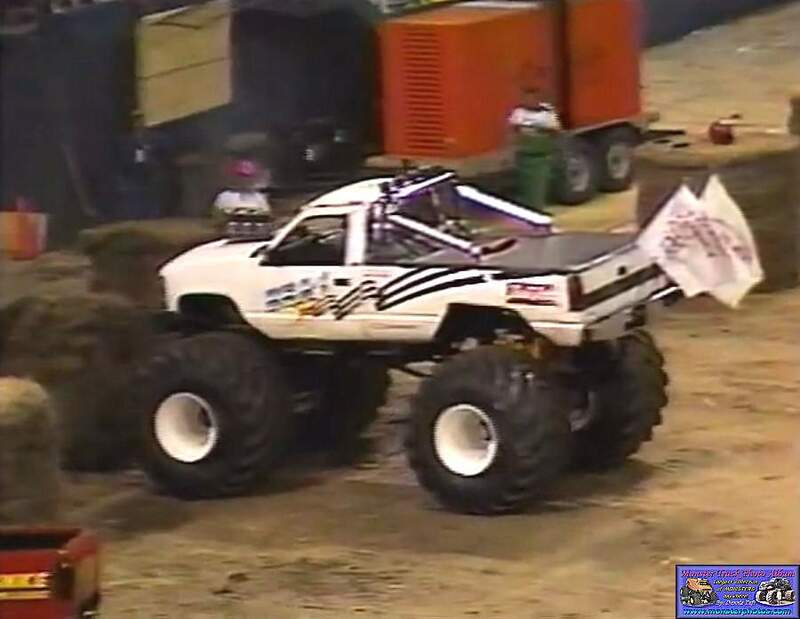 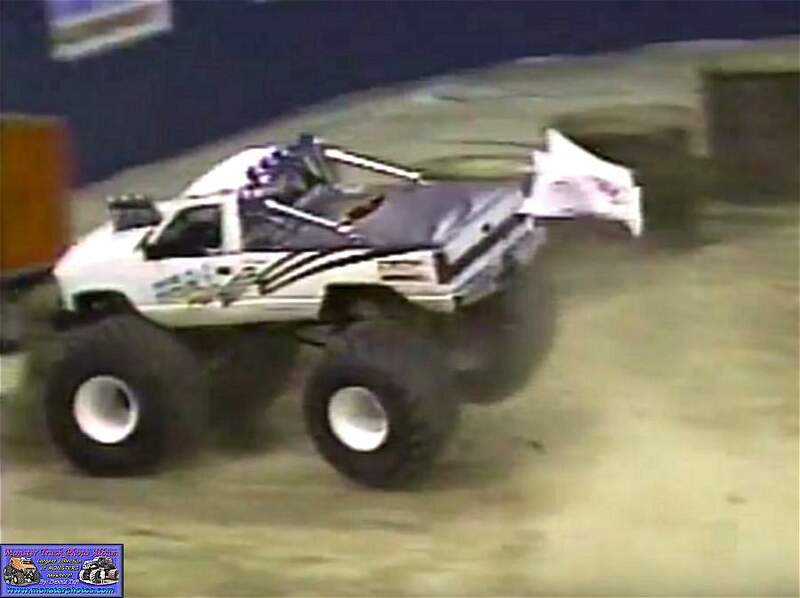 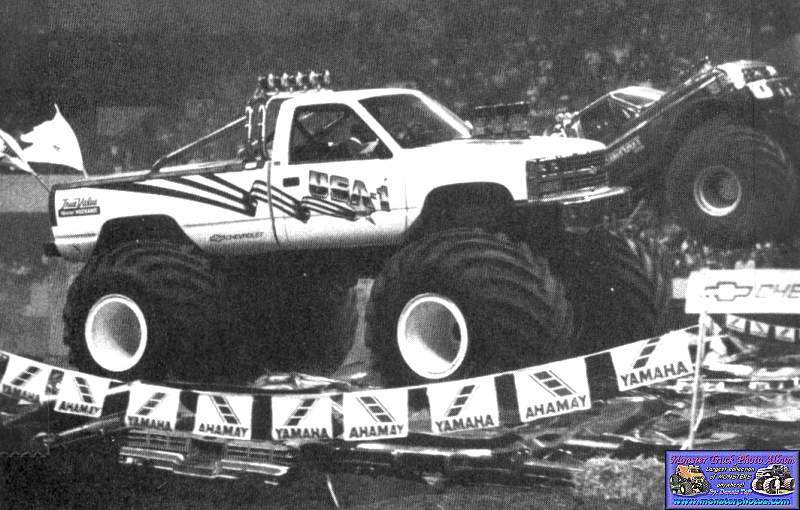 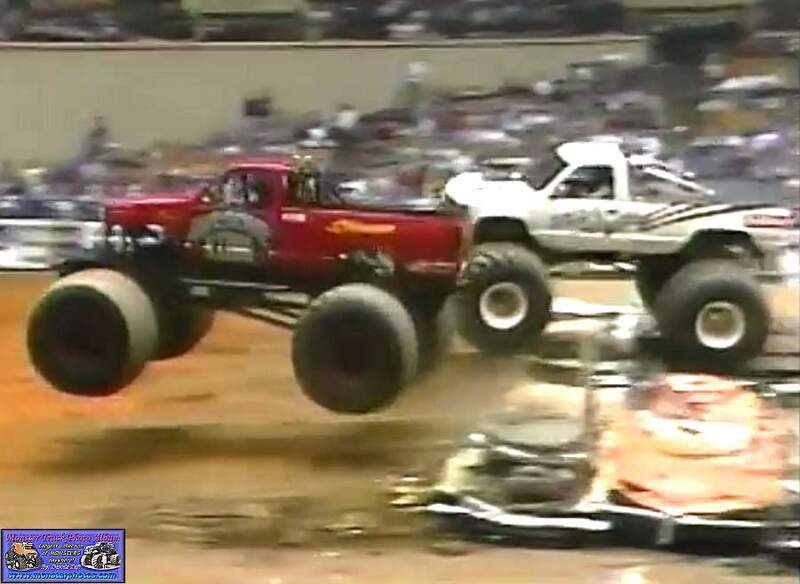 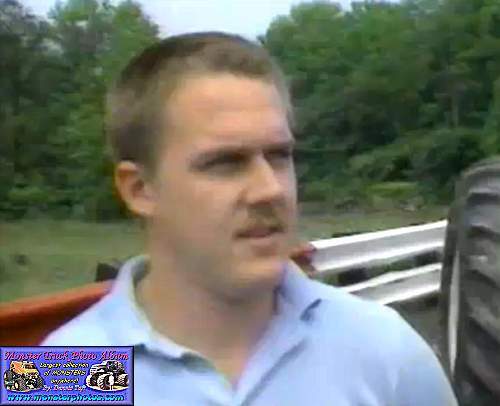 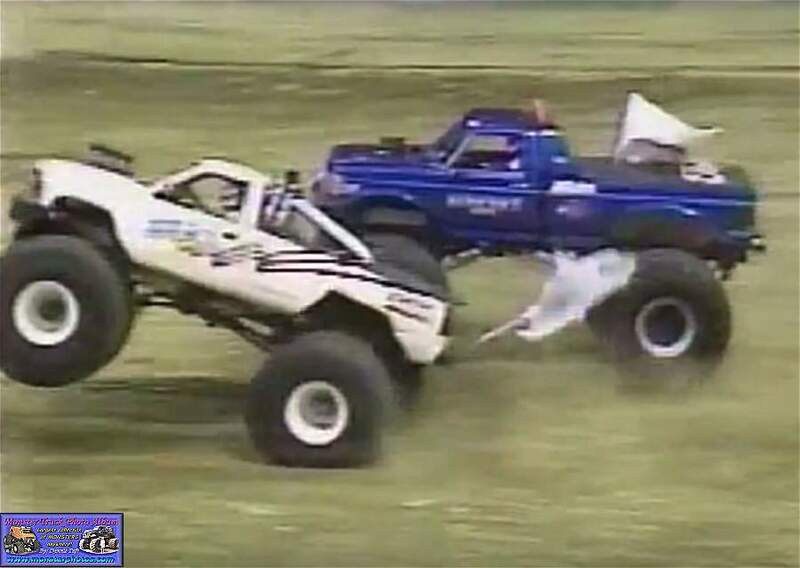 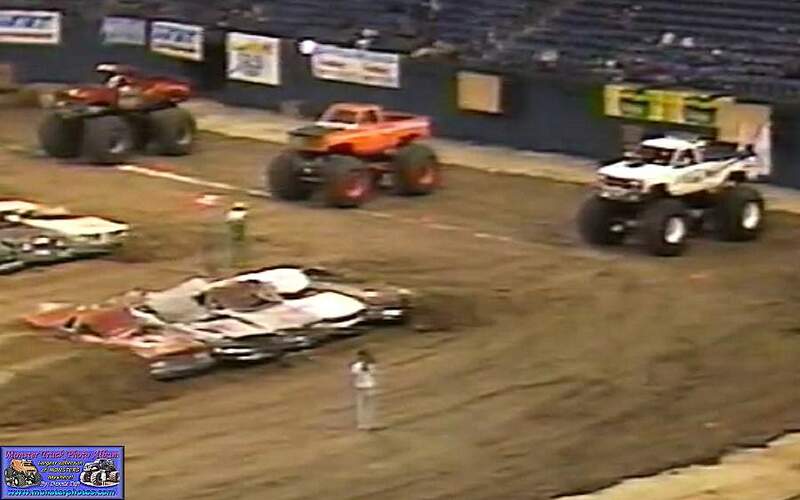 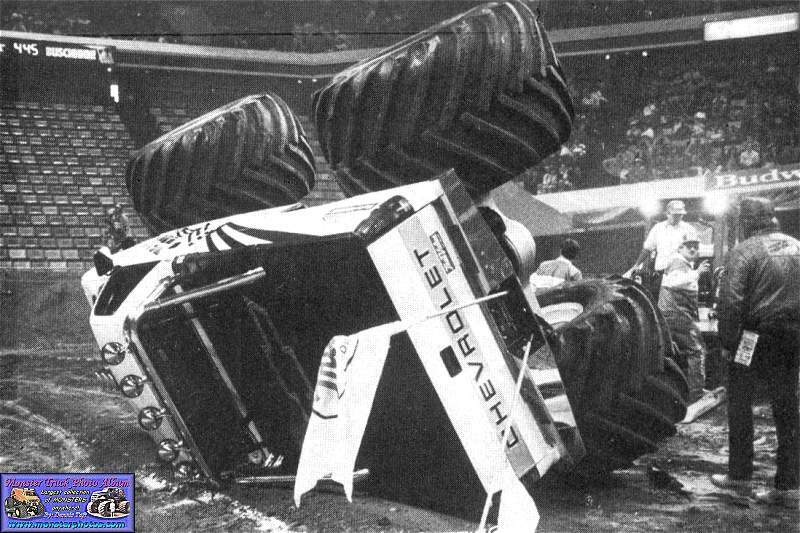 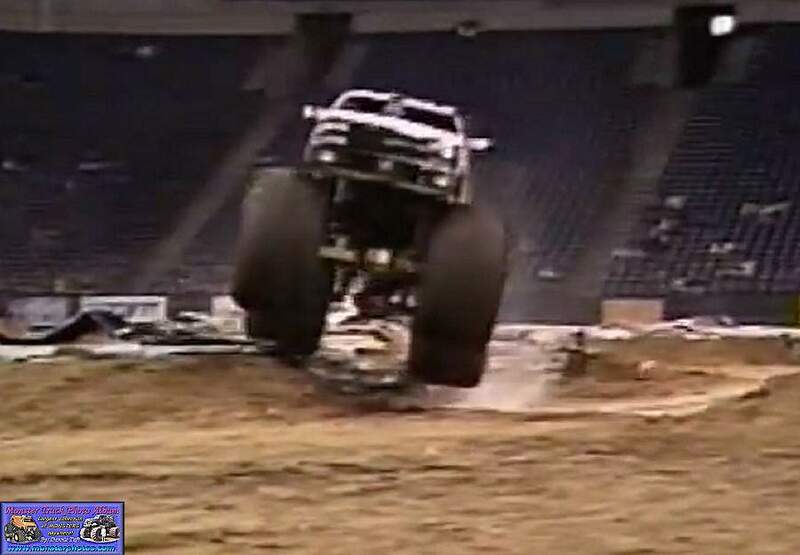 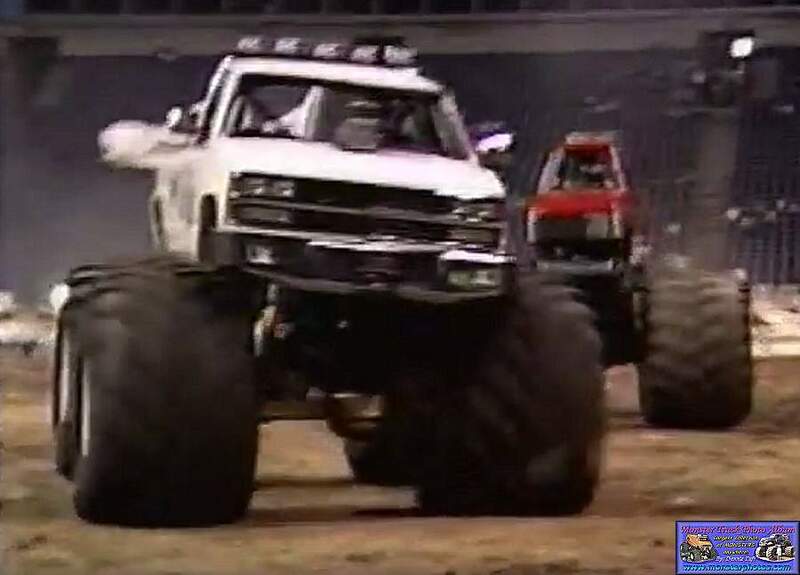 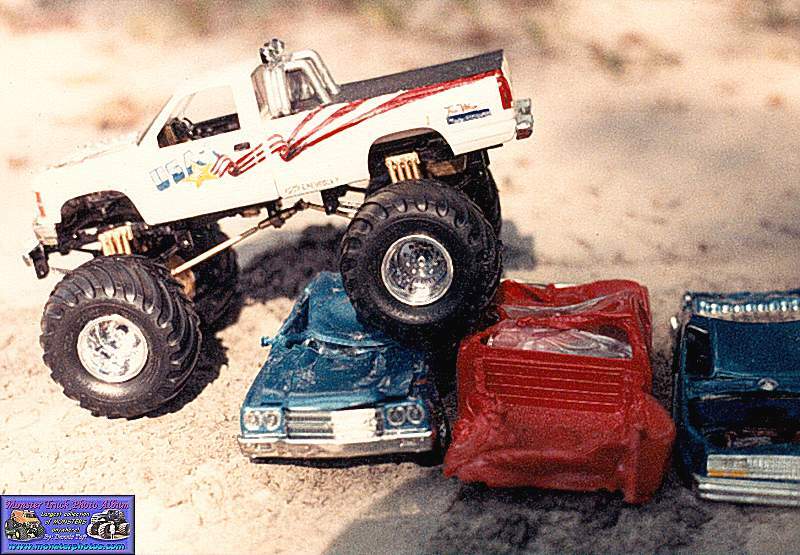 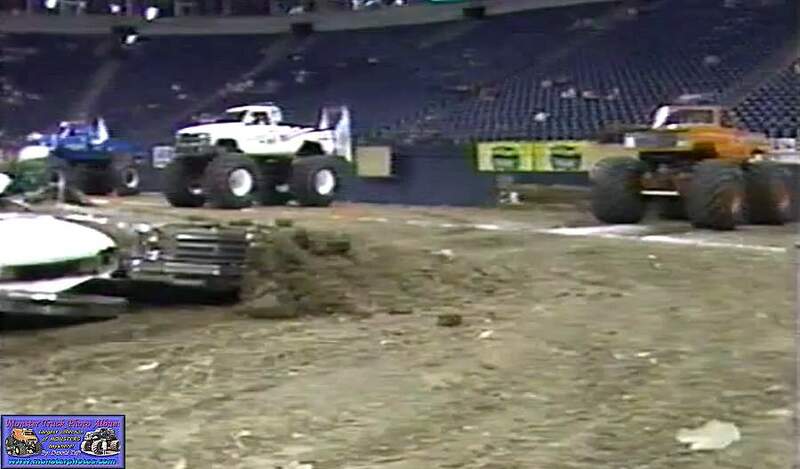 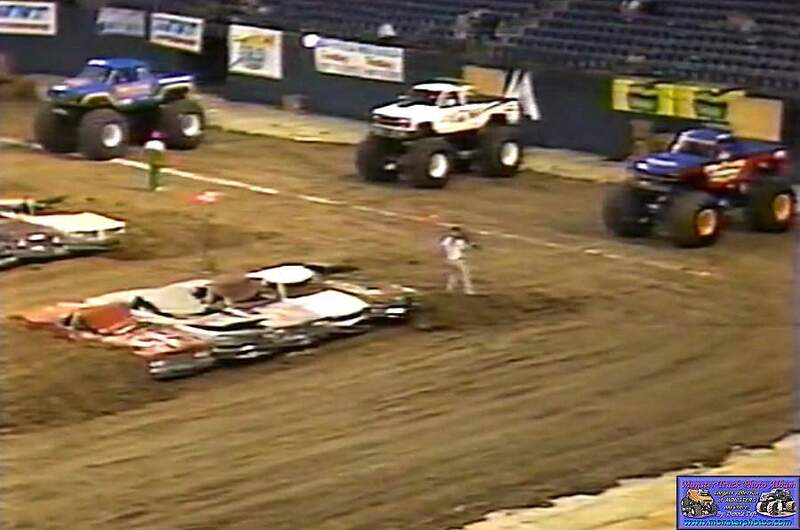 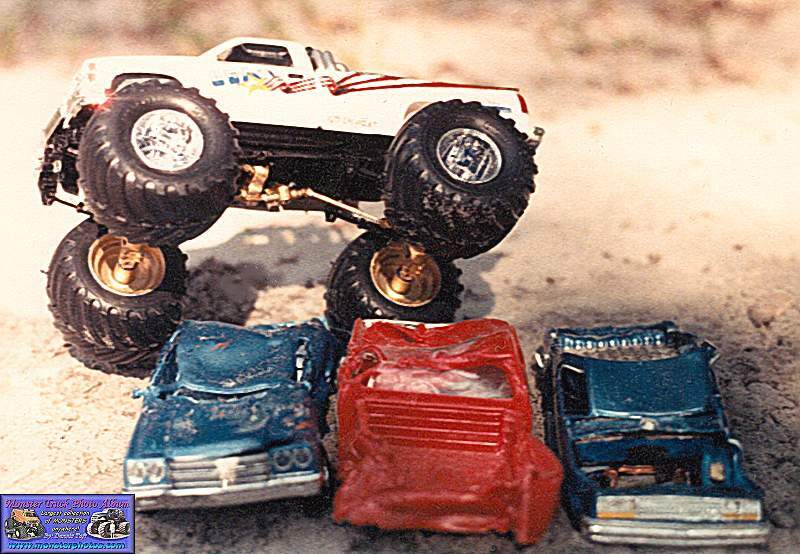 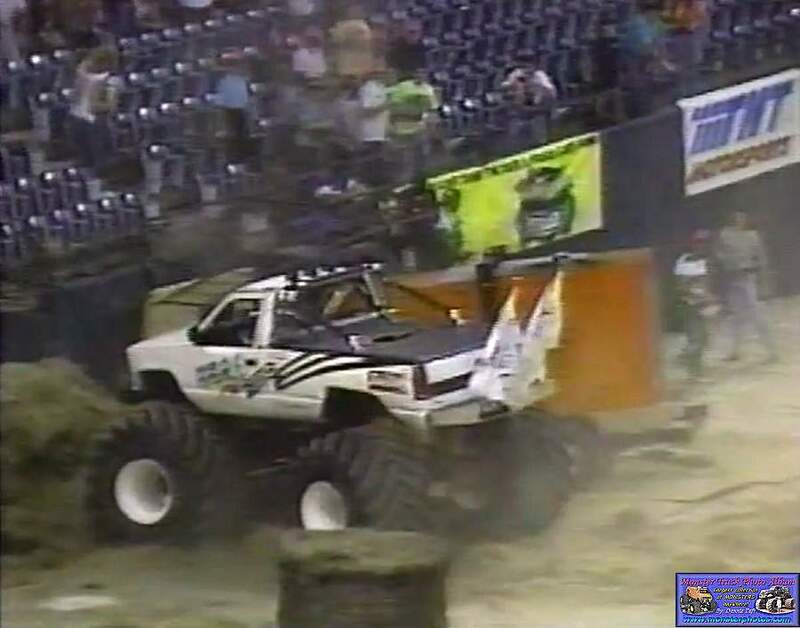 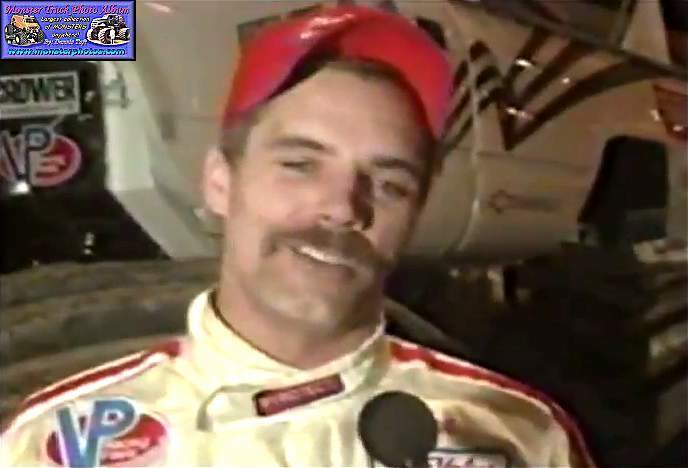 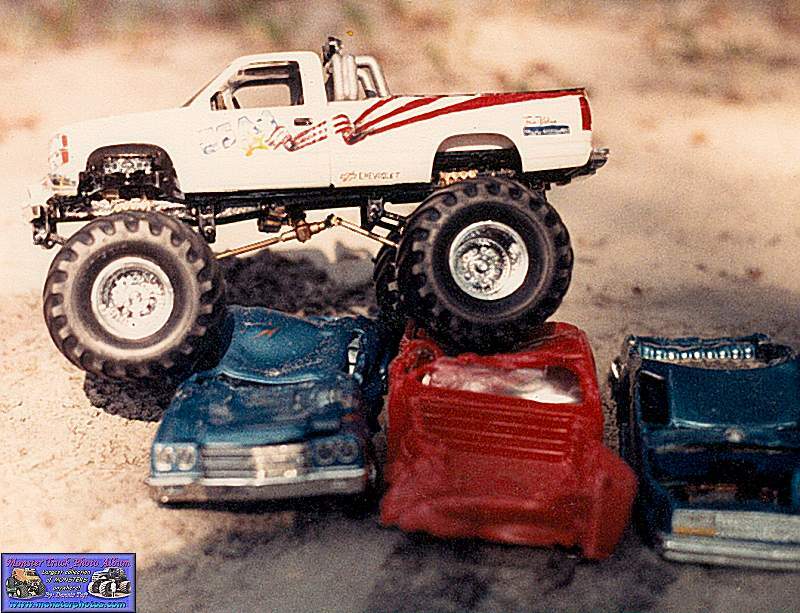 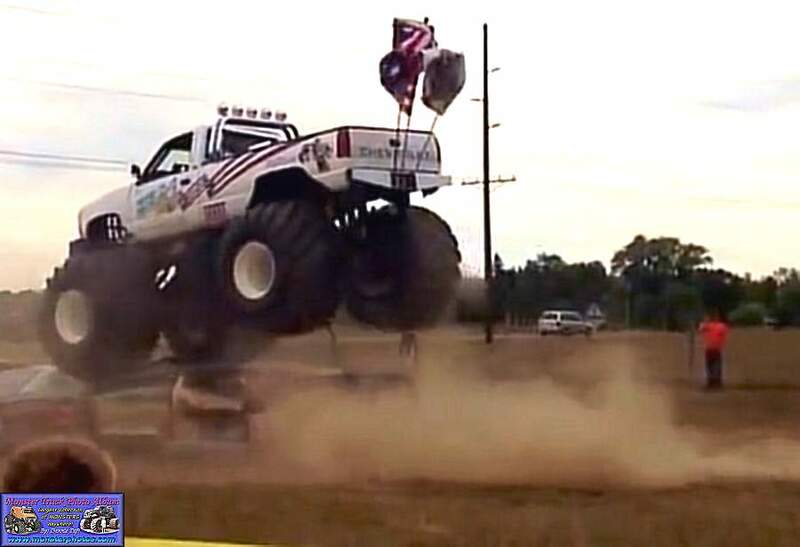 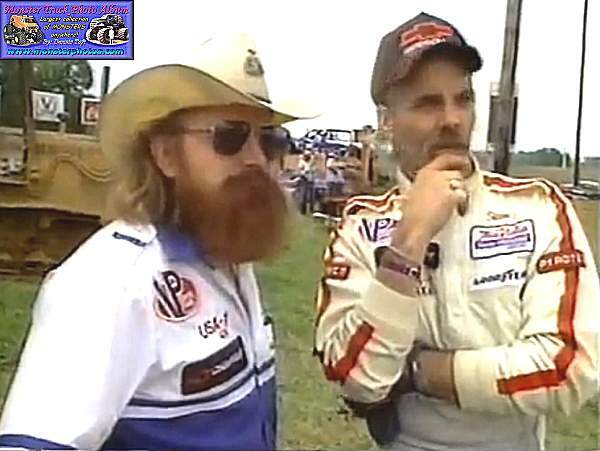 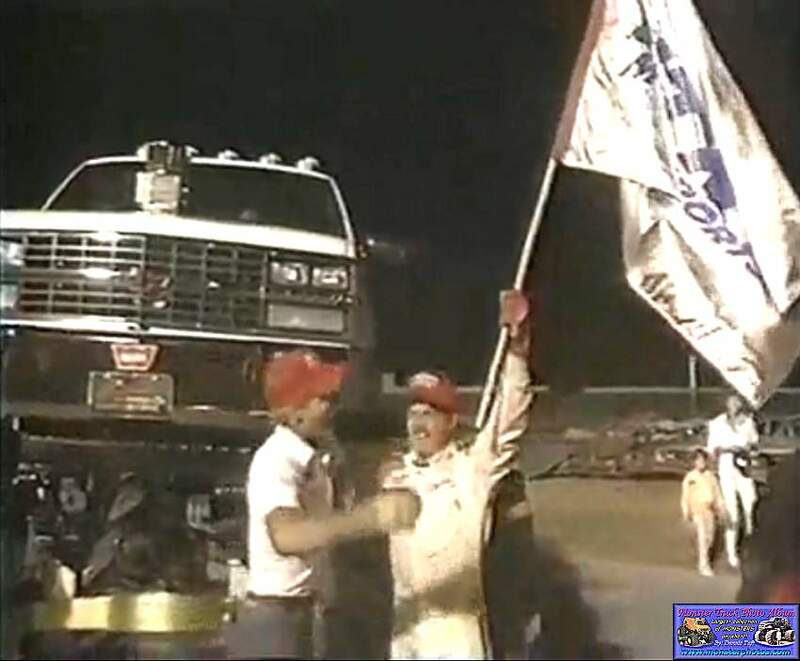 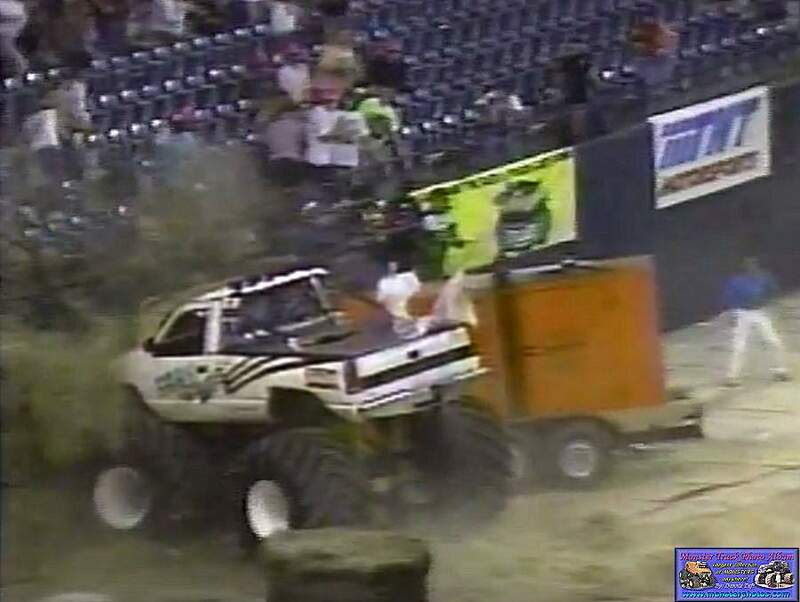 Early in 1989 during an exhibition show the truck flipped again. 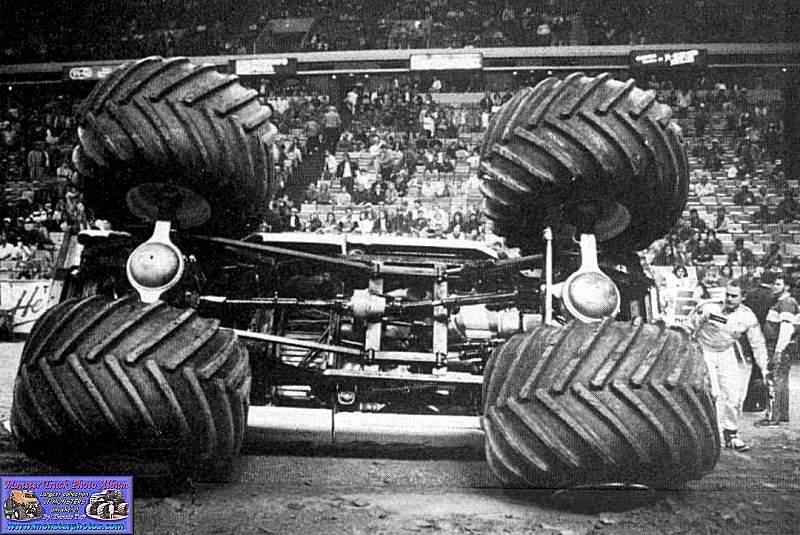 After a couple weeks it flipped a 3rd time. 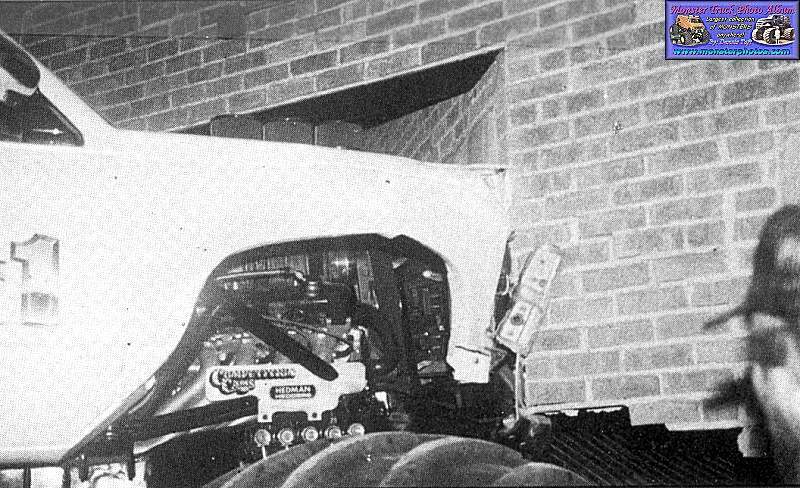 Then it hit a brick wall twice. 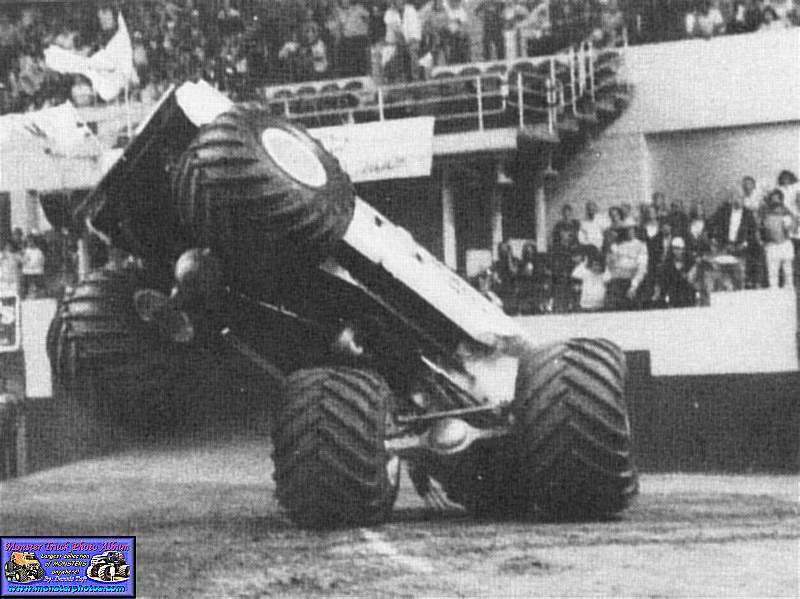 Then flipped a 4th and 5th time, then lightly laid it over for the 6st, then a violent 7th time. 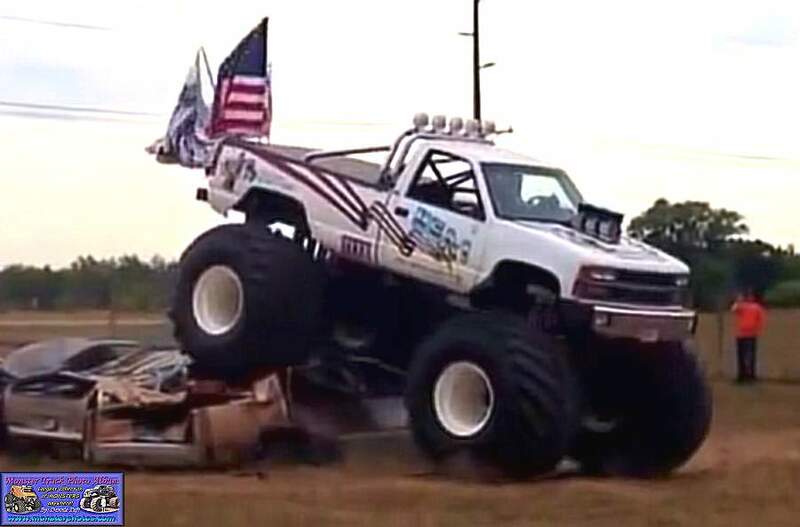 The count goes on but I stopped counting. 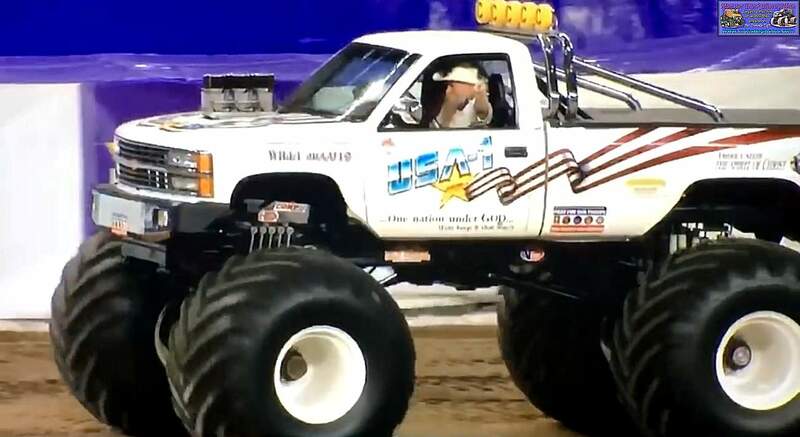 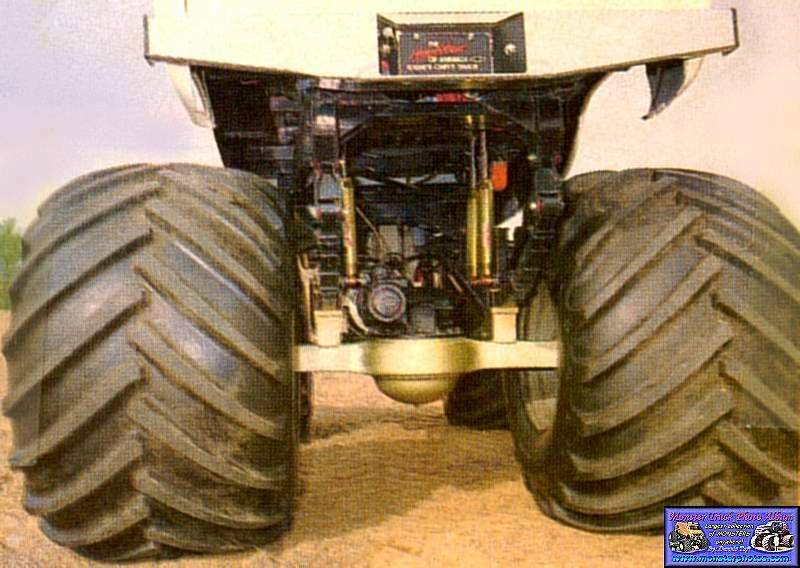 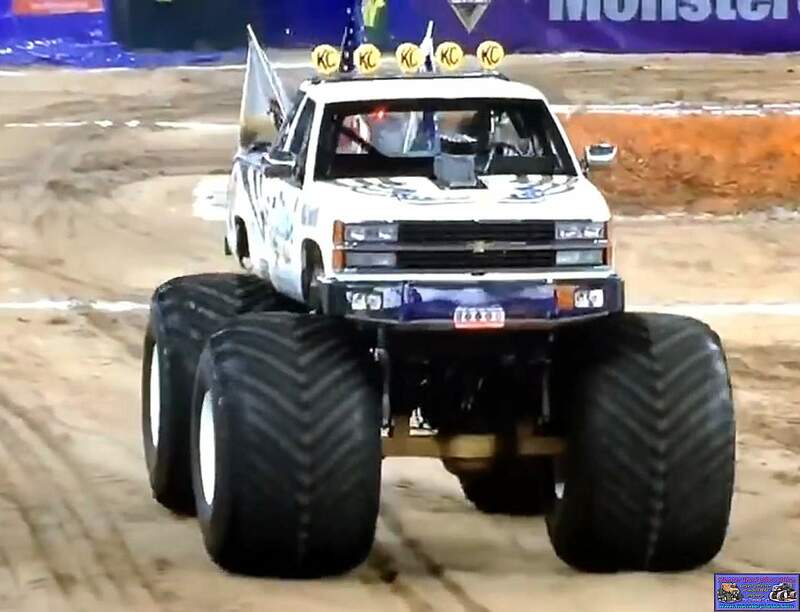 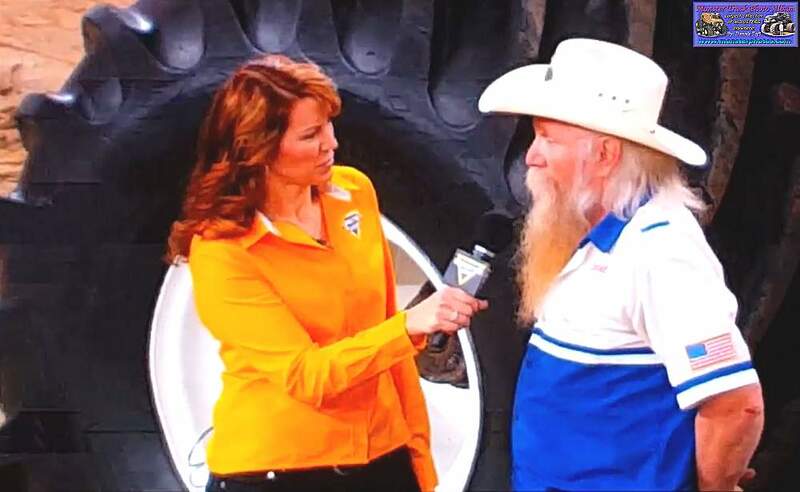 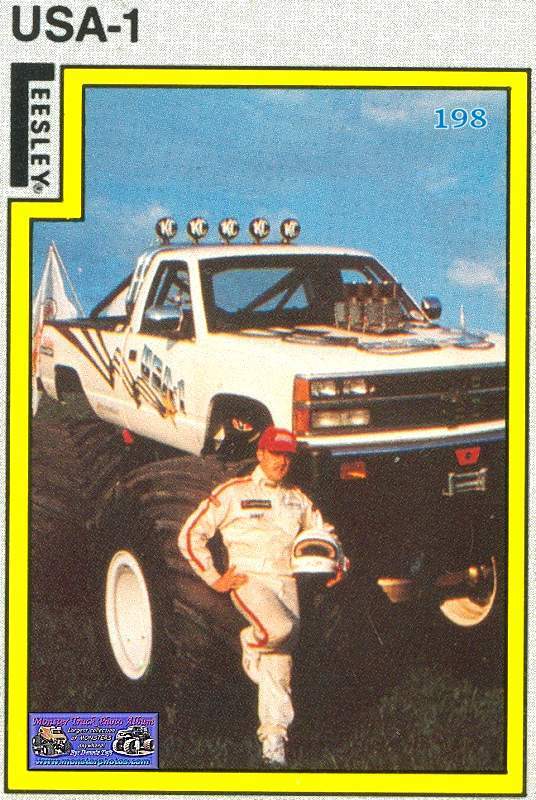 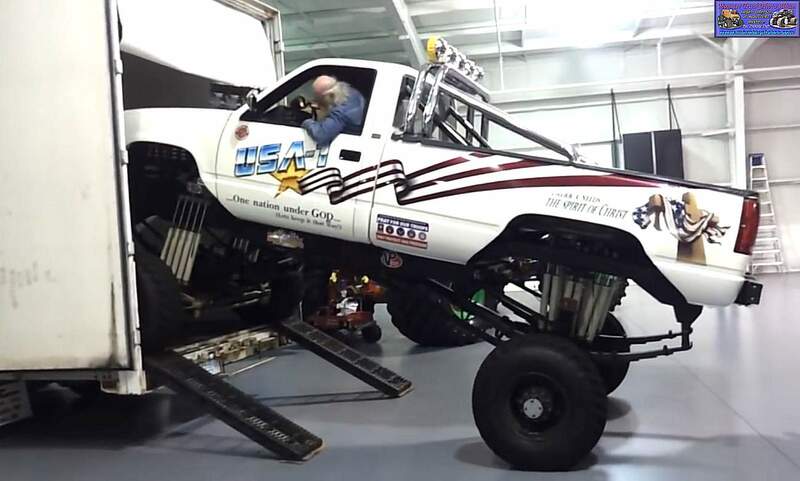 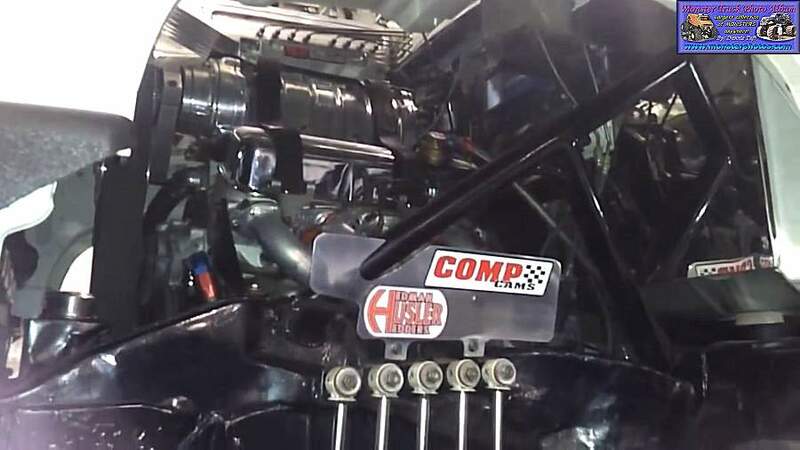 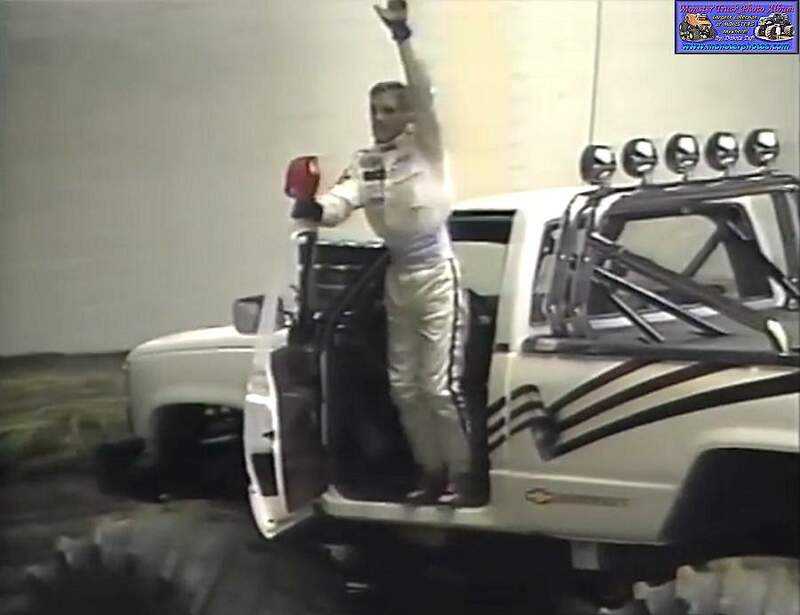 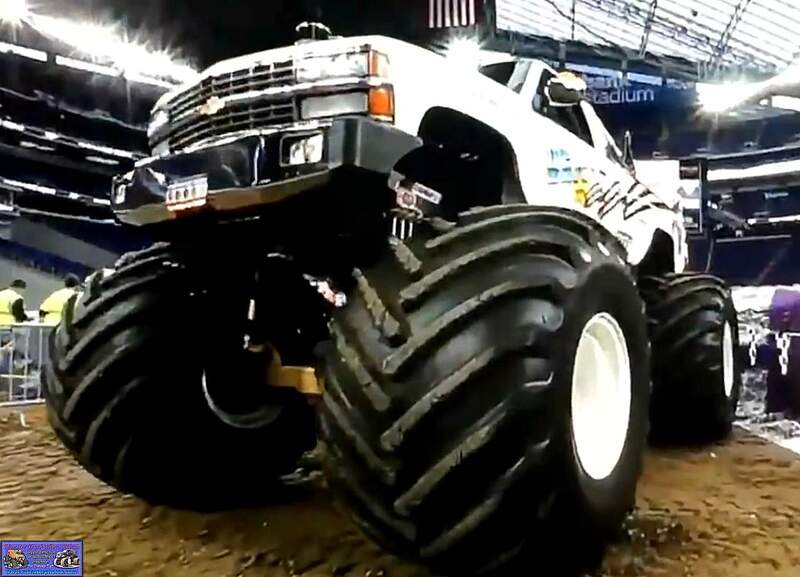 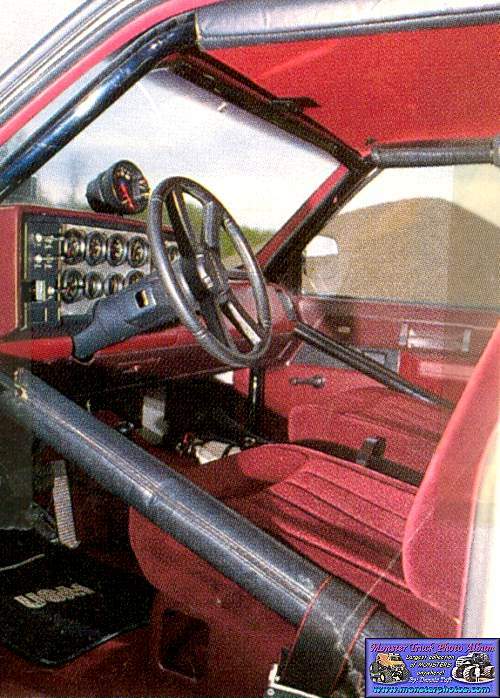 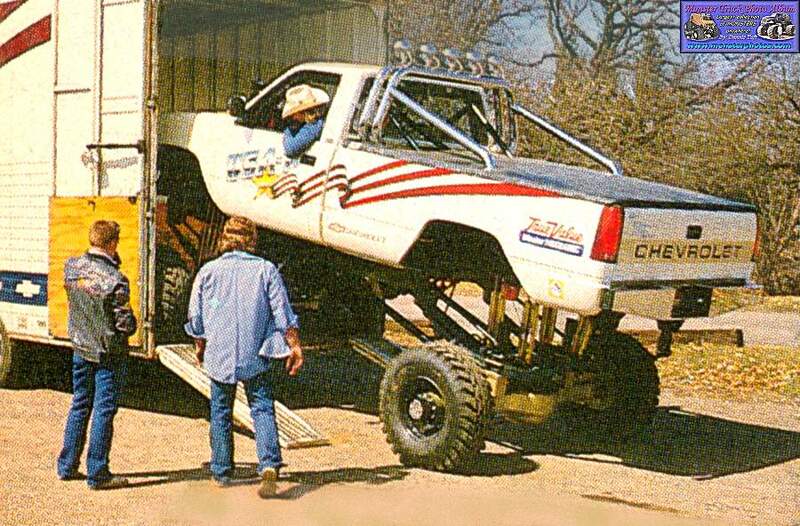 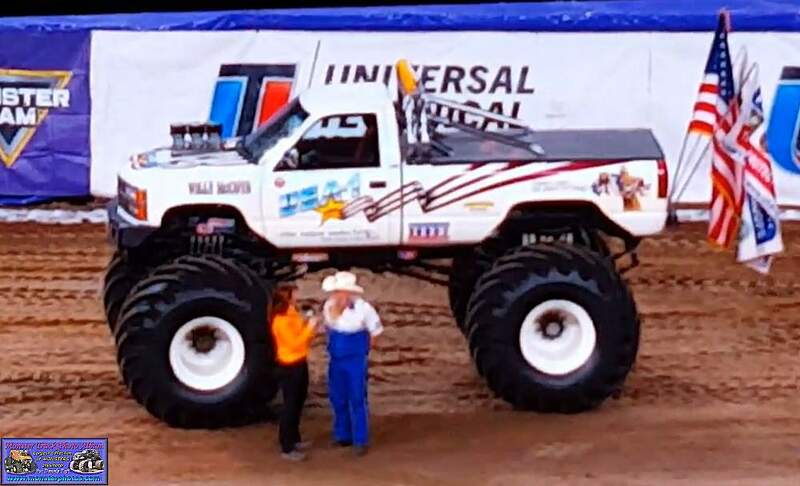 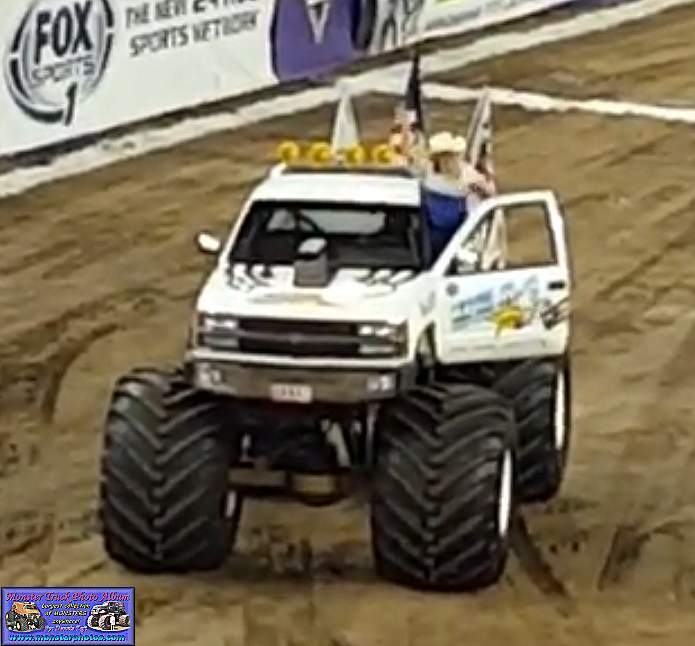 The truck was just too fast for the suspension at the time, even though it had one of the best suspensions in the business. 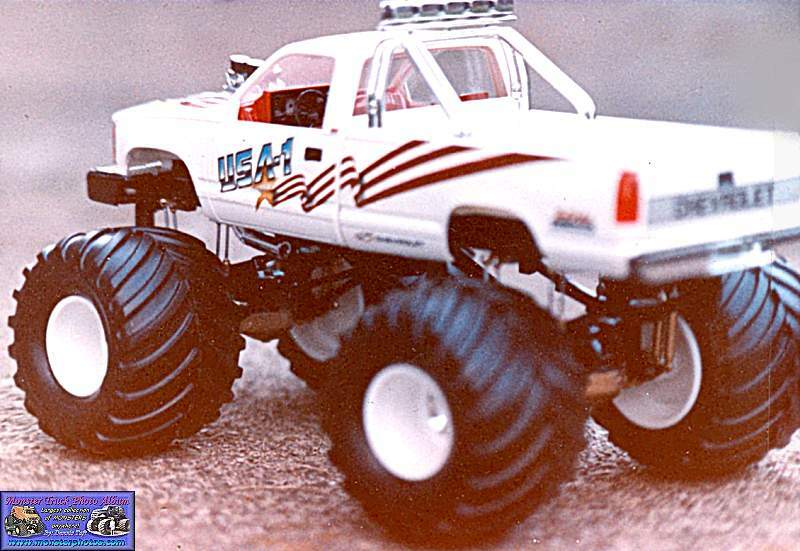 This is a model I built before AMT/ERTL came out with a USA-1 kit. 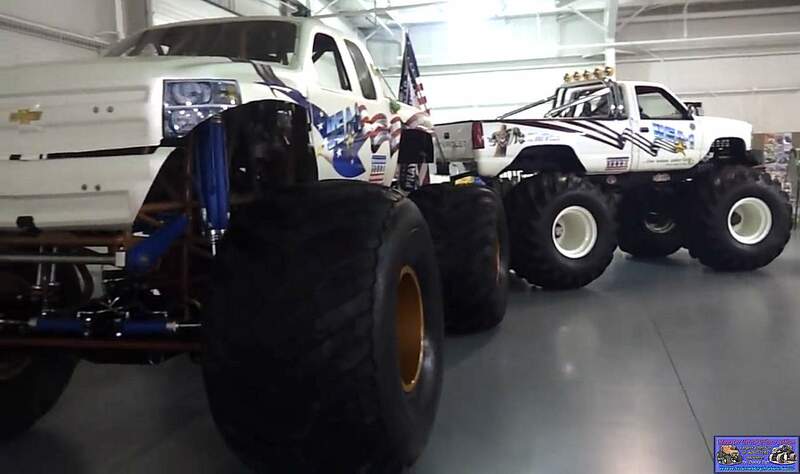 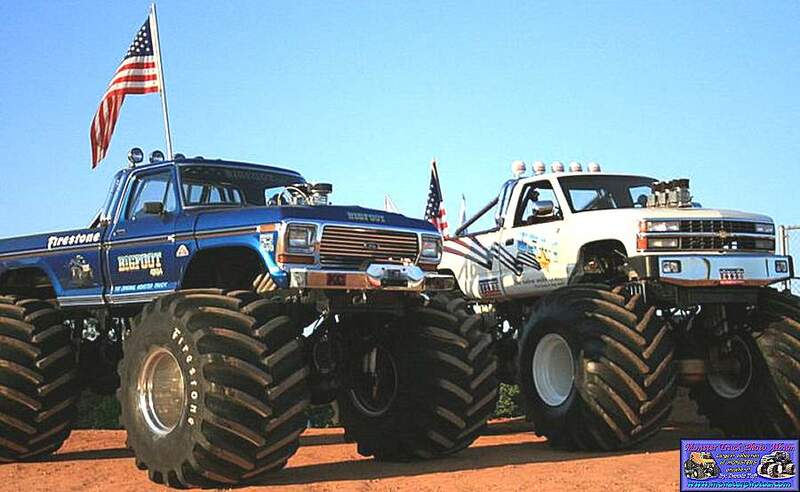 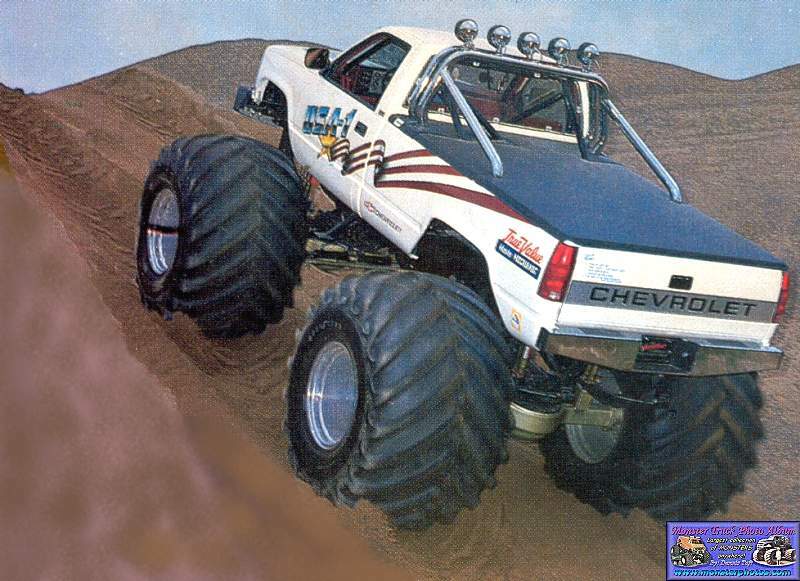 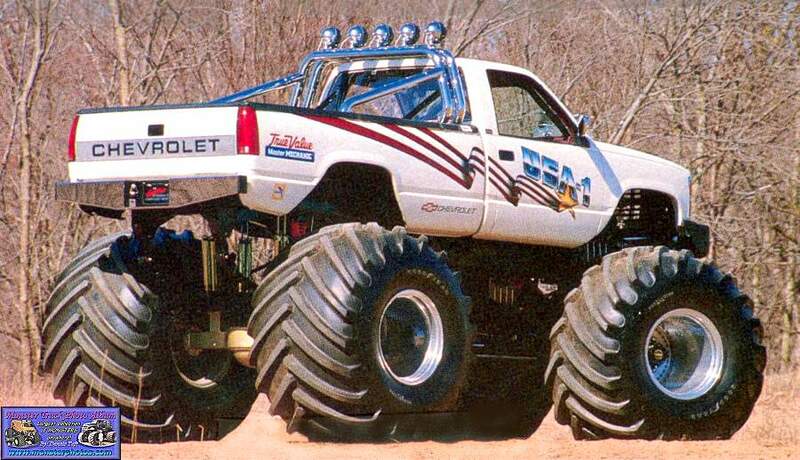 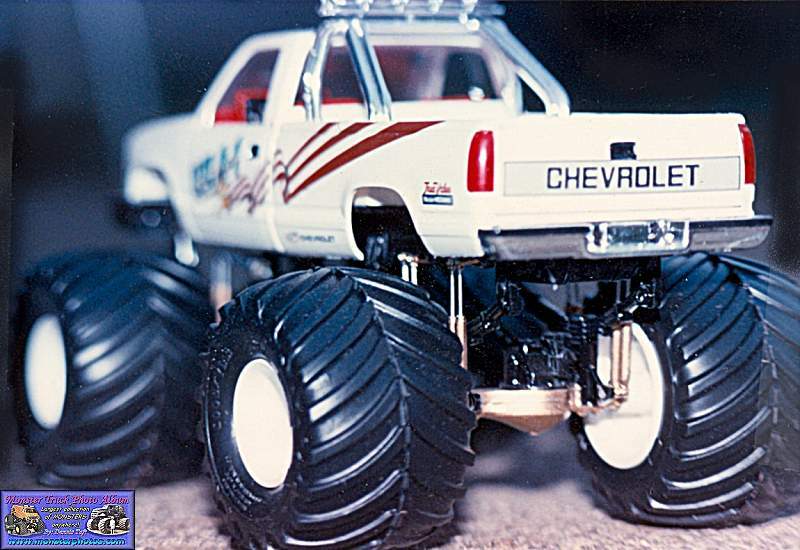 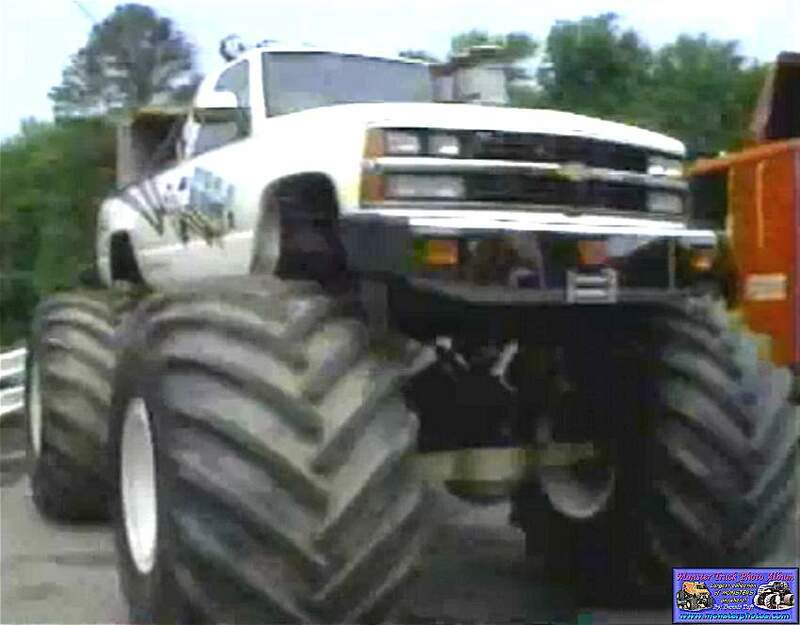 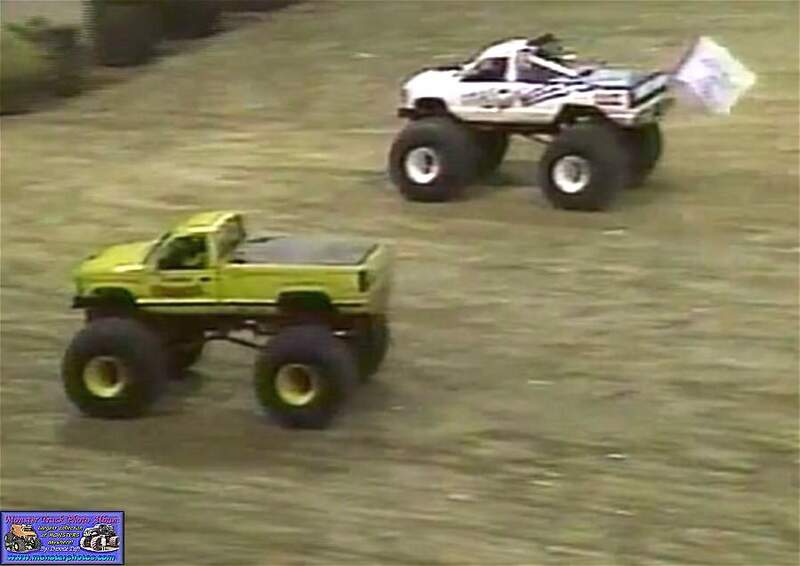 It was built useing a Bigfoot kit and a Chevy Silverado kit. 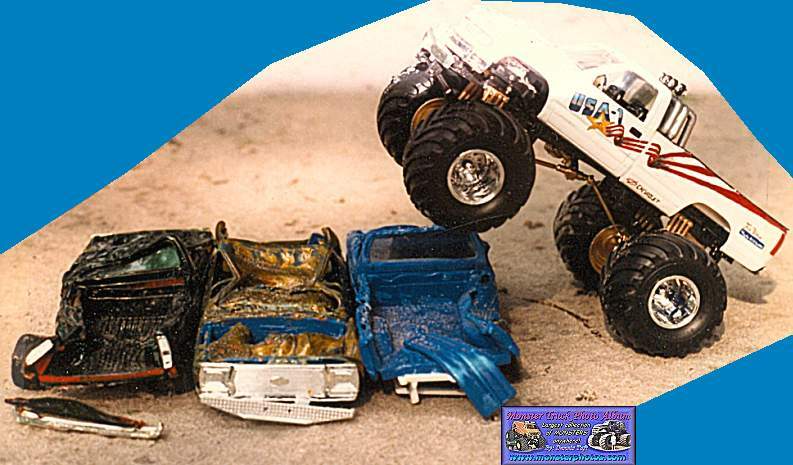 I hand painted every thing. 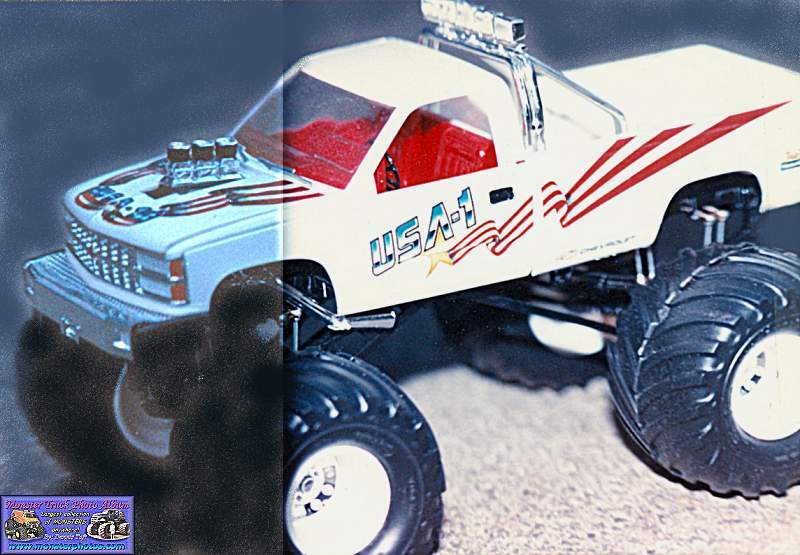 This is a model I built for Army Armstrong. 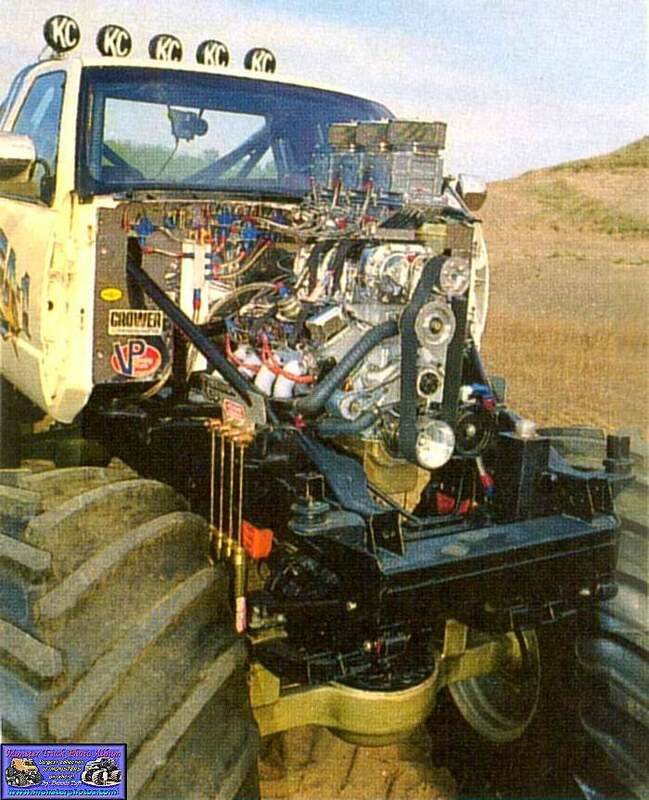 It was built right out of the box. 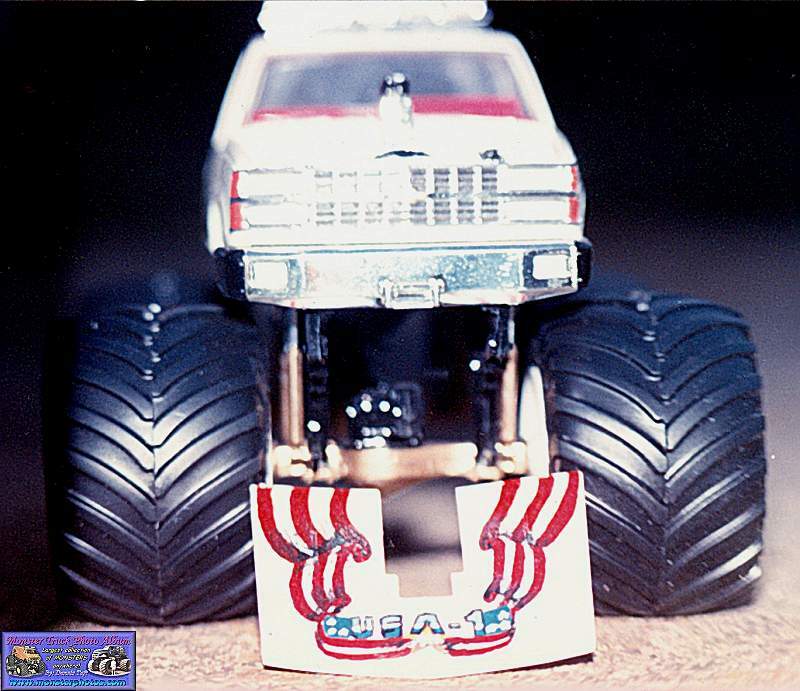 I had to hand paint the hood as the kit didn't have a decal for that.